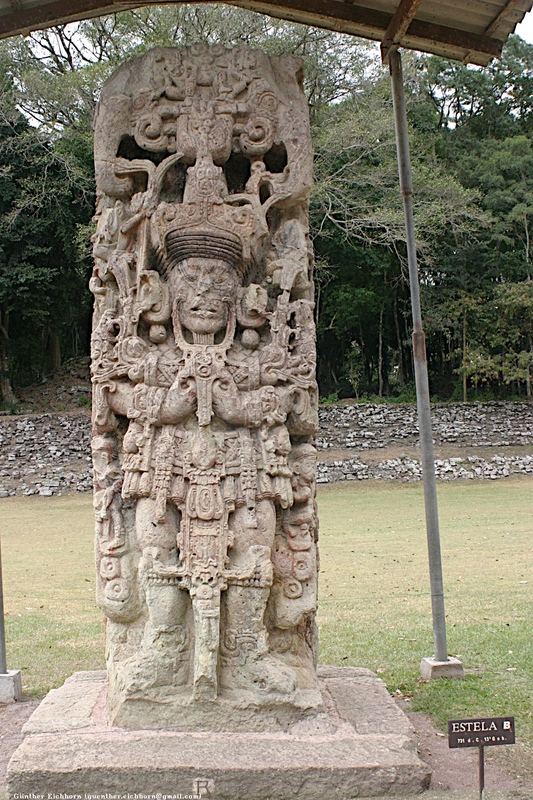 The Stelae in Copán are extraordinary. 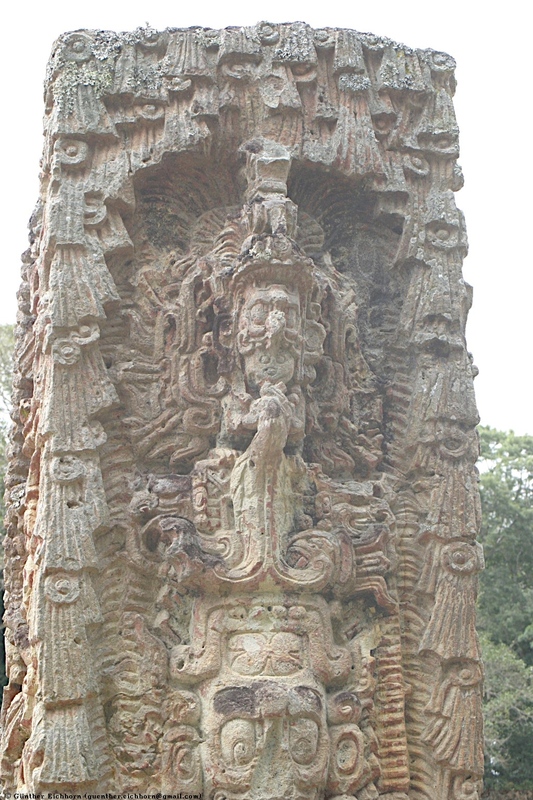 They have extensive inscriptions and sculptures. 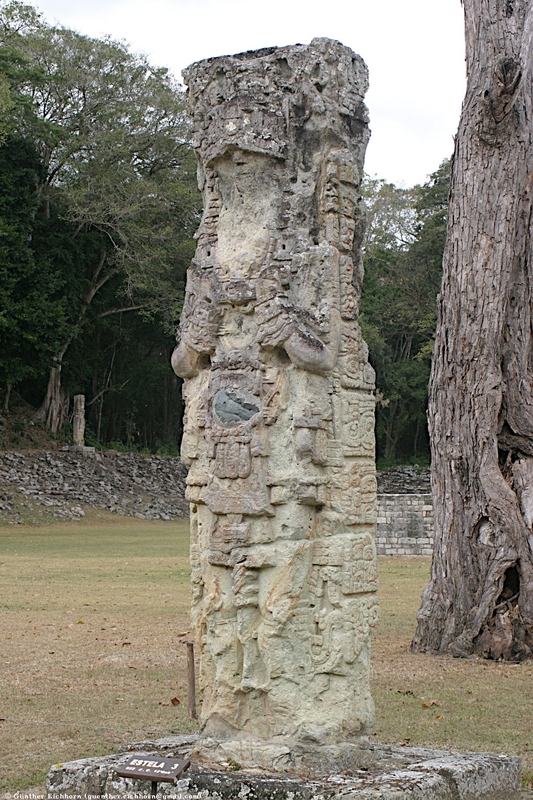 The Stelae all have an altar associated with them, placed in front of the stela. 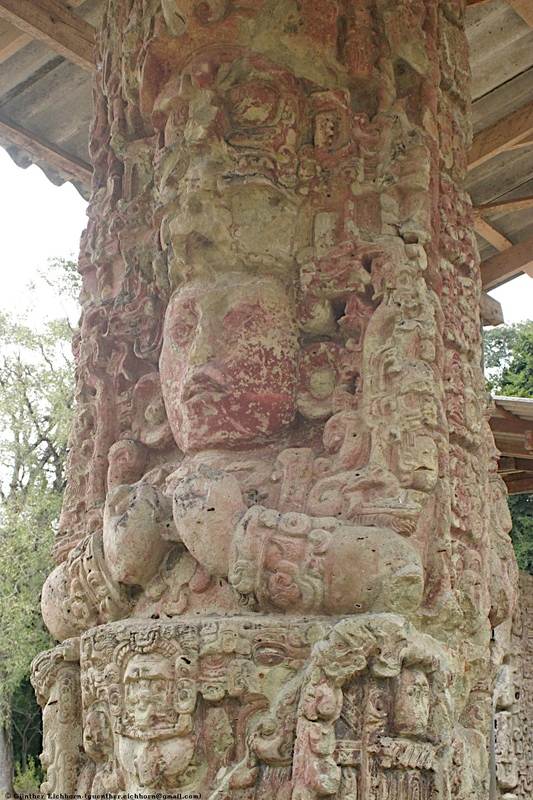 These altars are associated with blood letting ceremonies. 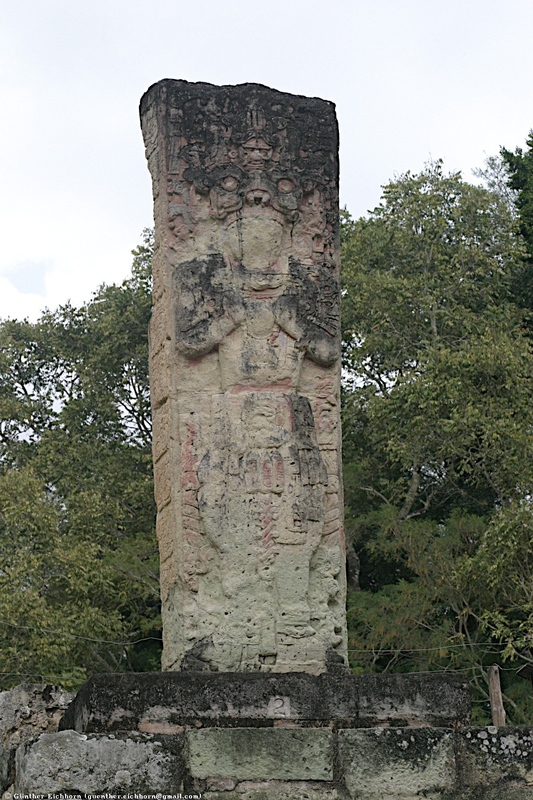 The hieroglyphs on the Stelae describe the ruler that built them, and the reason, like ascension to the throne, or a significant calendar event. 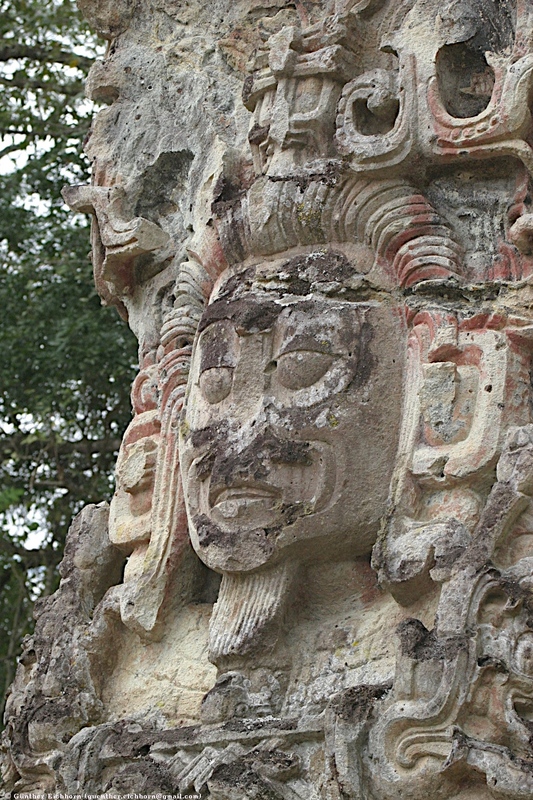 See Copán Temples for a description of the Temples. 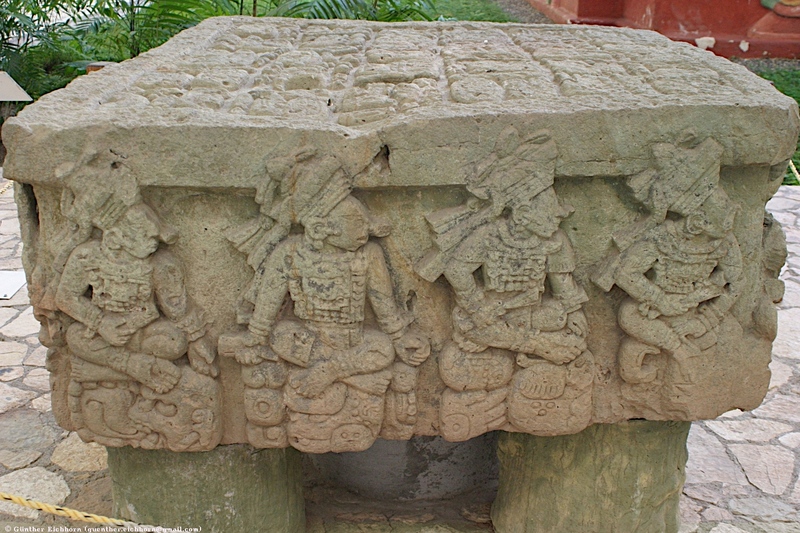 The rulers of Copán are described at Maya ruler genealogy. 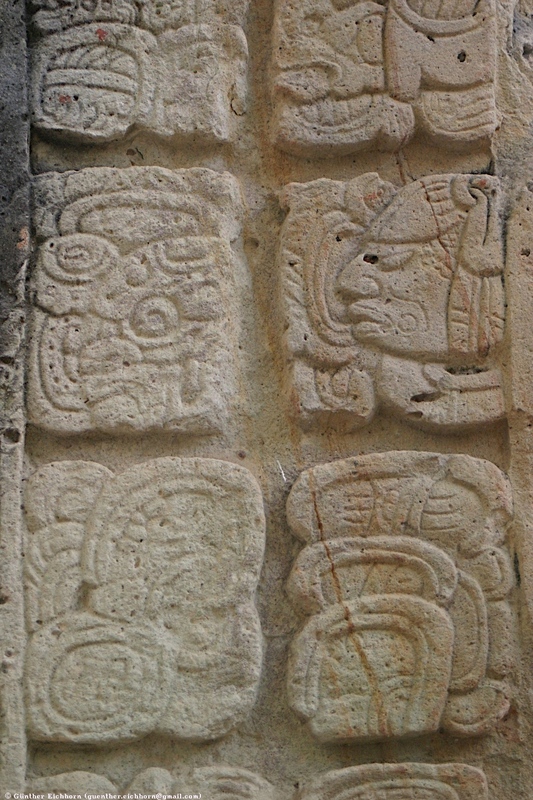 The Mayan calendar dates are shown in the Long Count notation or in the Calendar Round notation with Tzolk'in Cycle date and Haab' Calendar date. 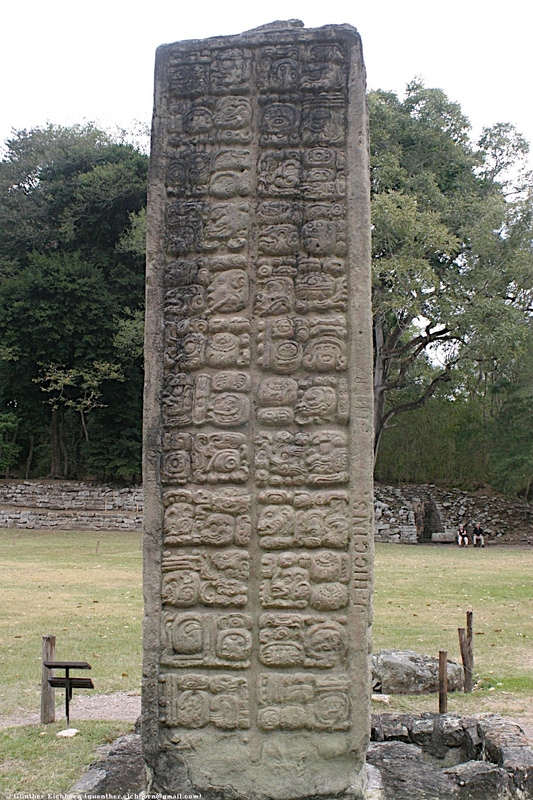 Stela A is located in the Plaza de las Estellas. 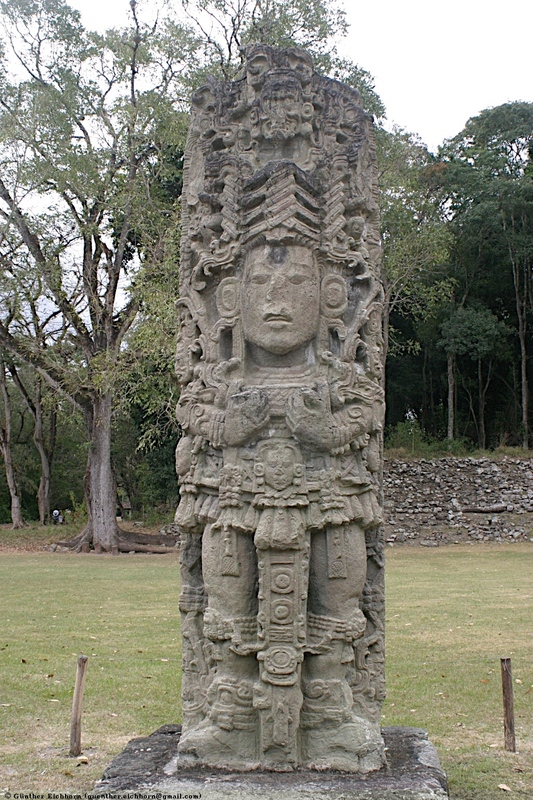 The original of this stela is in the Sculpture Museum. 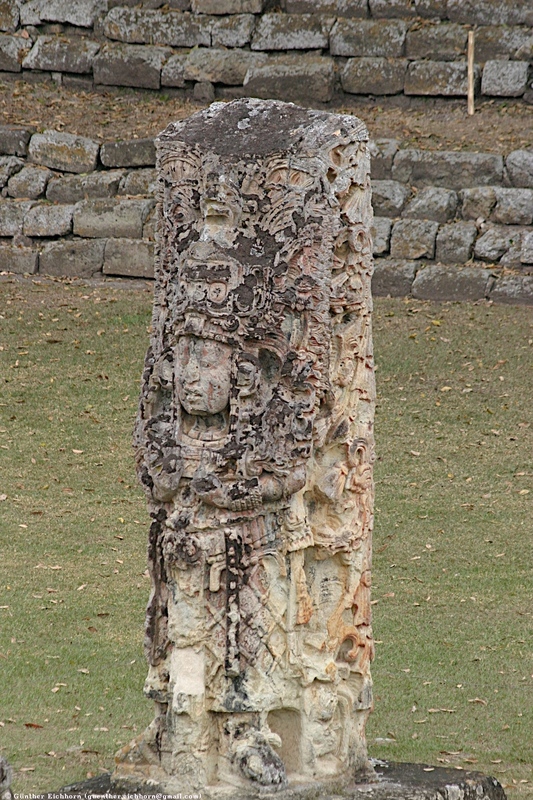 Stela A is perhaps the most beautiful of all the Stelae in Copán. It was dedicated on Long Count 9.14.19.8.12 (30 January, 731 CE). 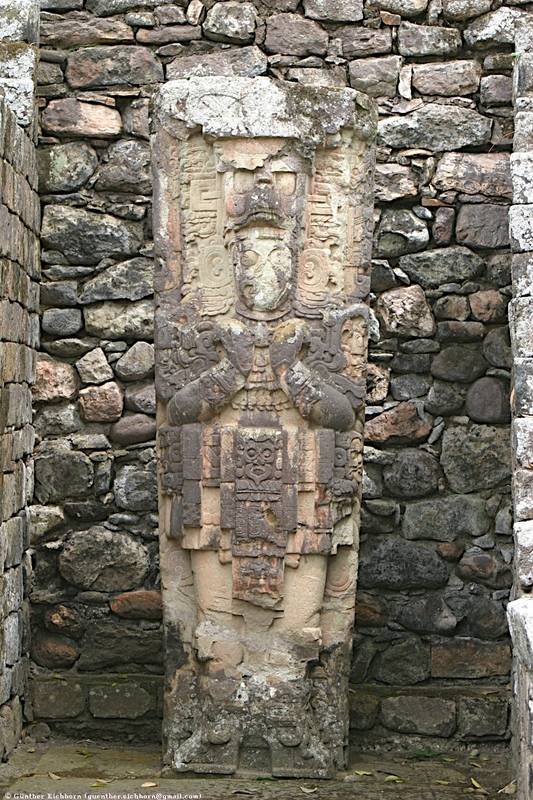 It portrays the 13th ruler of Copán Waxaklajun Ub'aah K'awiil (18 Rabbit, see Maya ruler genealogy) carrying a two-headed centipede bar that is symbolically giving birth to sun deities. 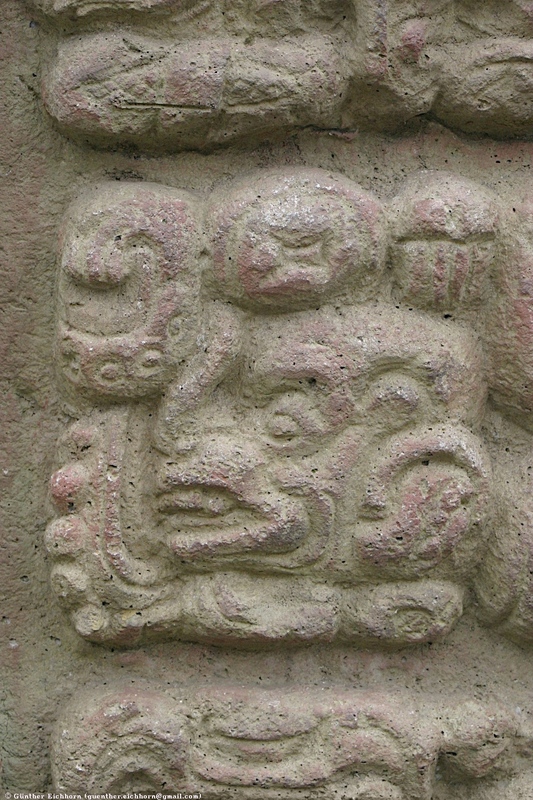 In the headdress is a woven mat design with four centipedes in the corners. 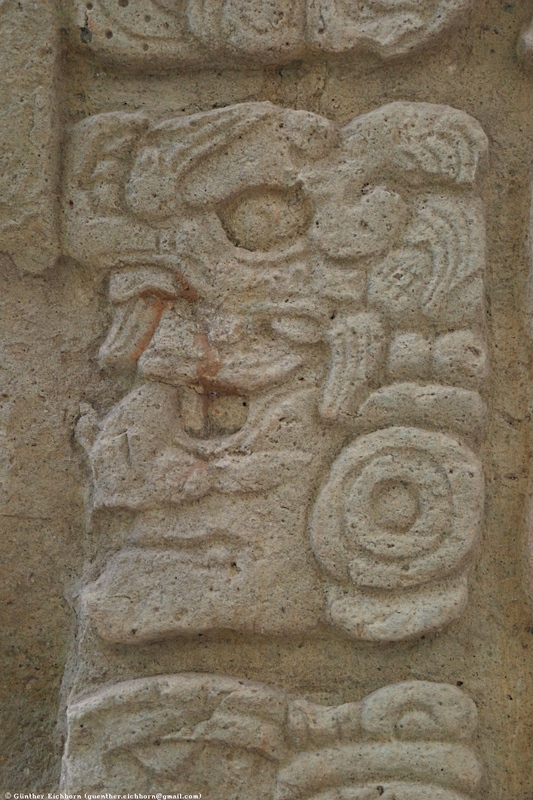 Small figures that crouch at his feet and in his headdress seem to represent the sun at different stages of its daily and yearly cycles. The inscription on Stela A outlines the erection of the monument on the Calendar Round date of 12 Ajaw 18 Kumk'u, the month period is also 1 day before the end of the solar year. 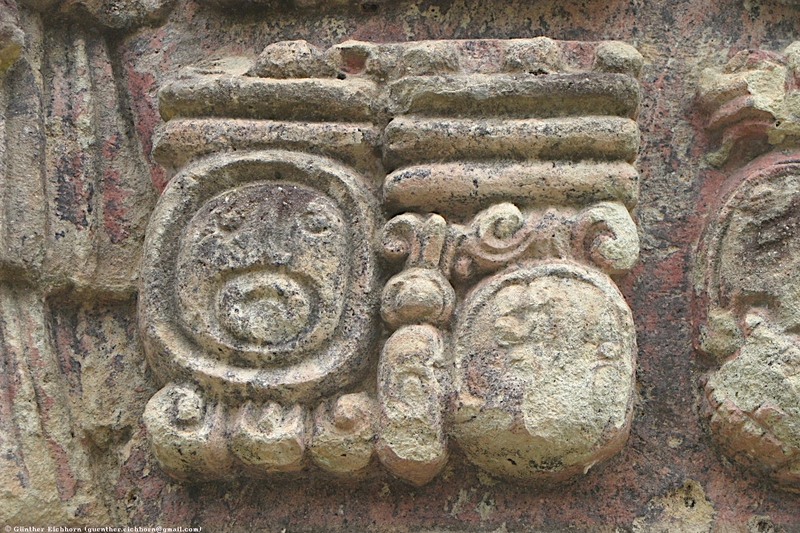 It represents the convergence of several cycles at that time with the iconography predominantly a solar theme. 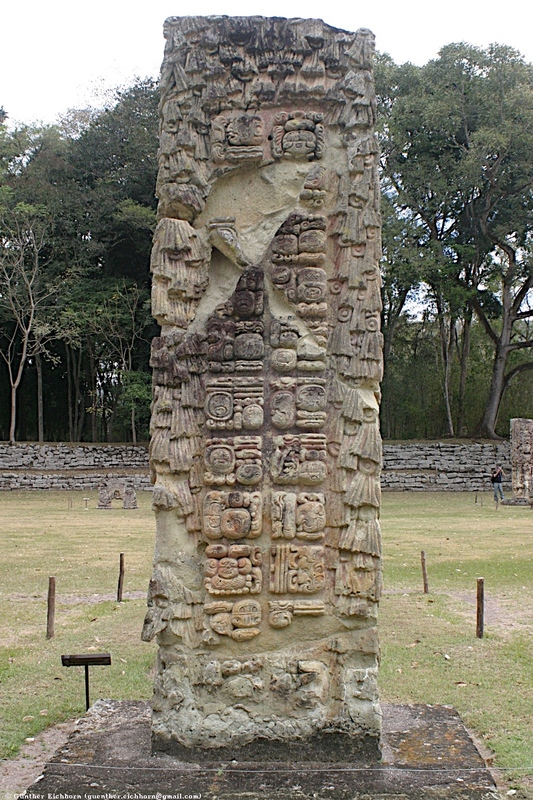 The inscription continues on the west side, with the erection of the monument, its name - The Great Sun (solar deity), then a distance number of 60 days (3 winals). It continues with the dedication date of Stelae H (Calendar Round 4 Ajaw 18 Muwan') which began the tzolk'in cycle. 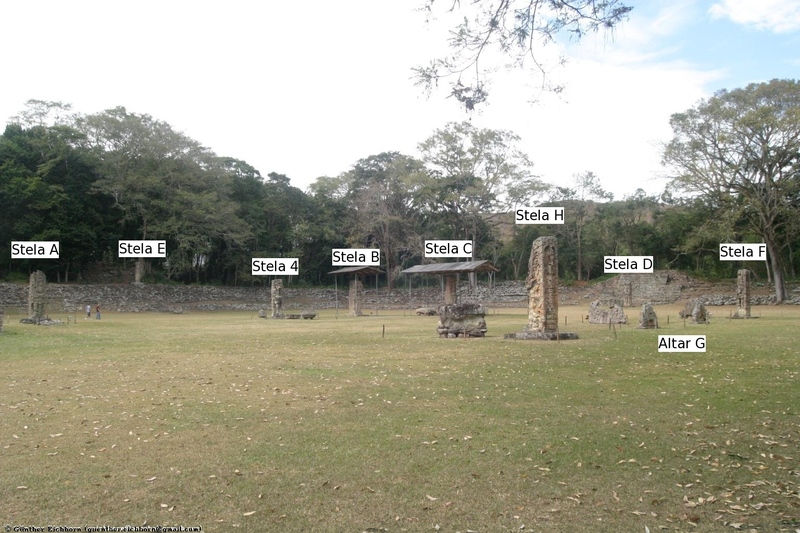 It then gives us the name of Stelae H, then launches into a very interesting passage. 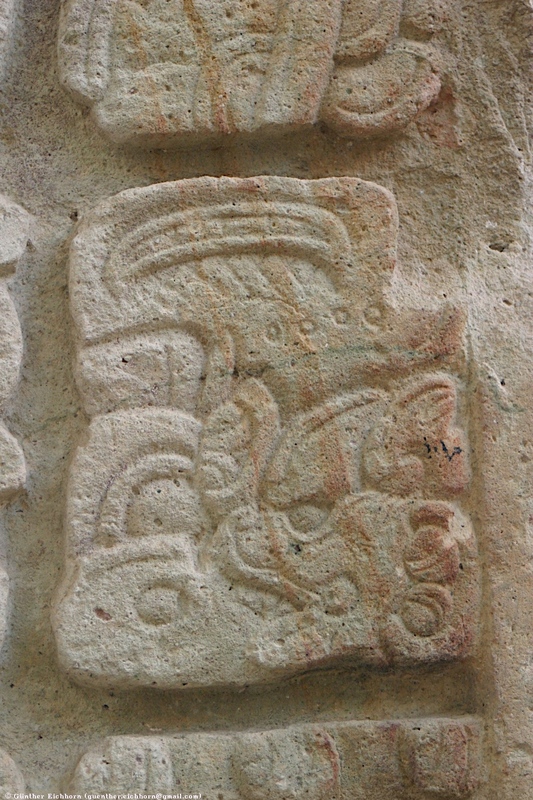 This passage tells what rituals 18 Rabbit performed in the 60 day tzolk'in division between Stelae H and A. 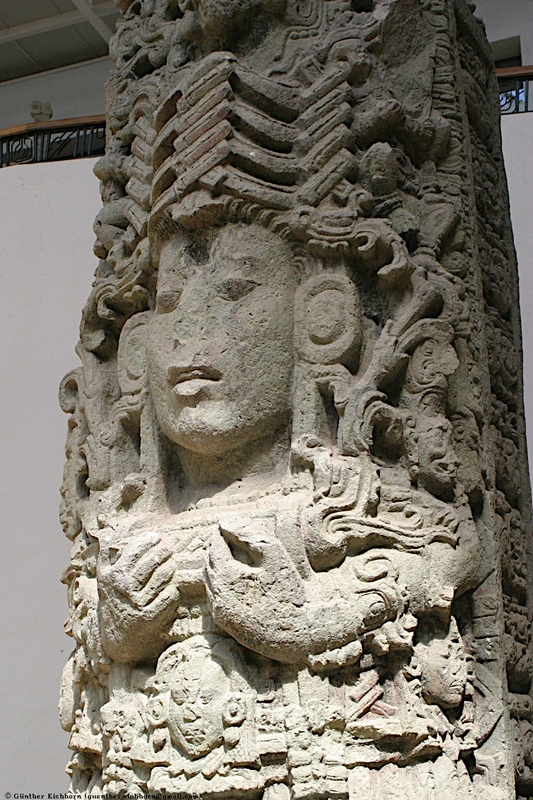 It concerns the death, afterlife, and rites of veneration of an ancestral ruler - Cauc Chan or Fire Serpent. 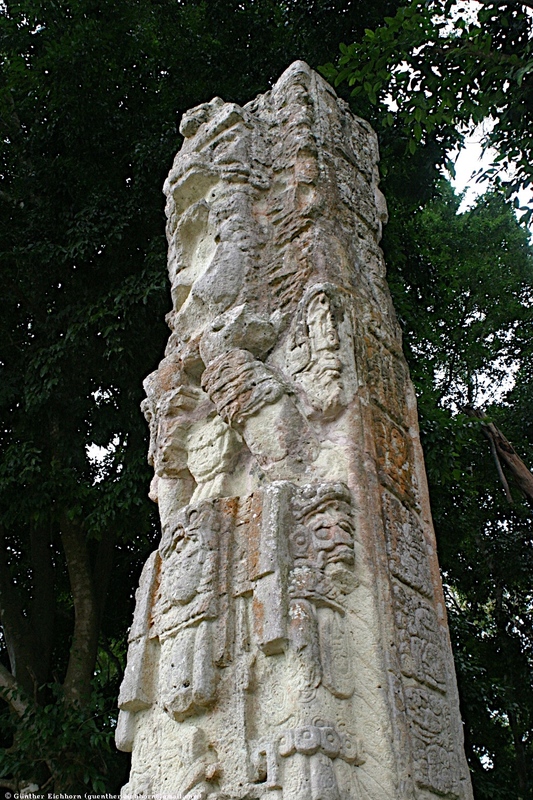 The original of Stela B is located in the Plaza de las Estellas. Like Steal A, it was build by 18 Rabbit. 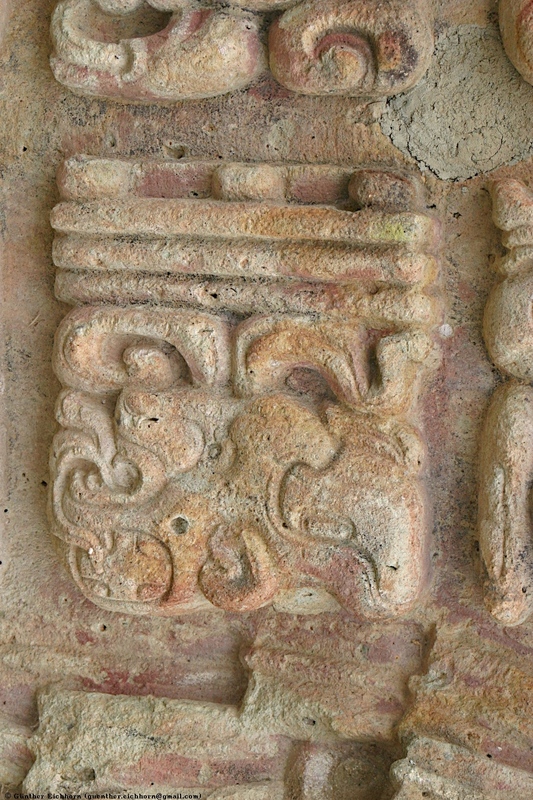 It was dedicated on Long Count 9.15.0.3.0 12, Calendar Round Ajaw 13 Mak (22 August 731 CE) It portrays the 13th ruler of Copán Waxaklajun Ubaah K'awiil (18 Rabbit, see Maya ruler genealogy) during his accession to the throne. 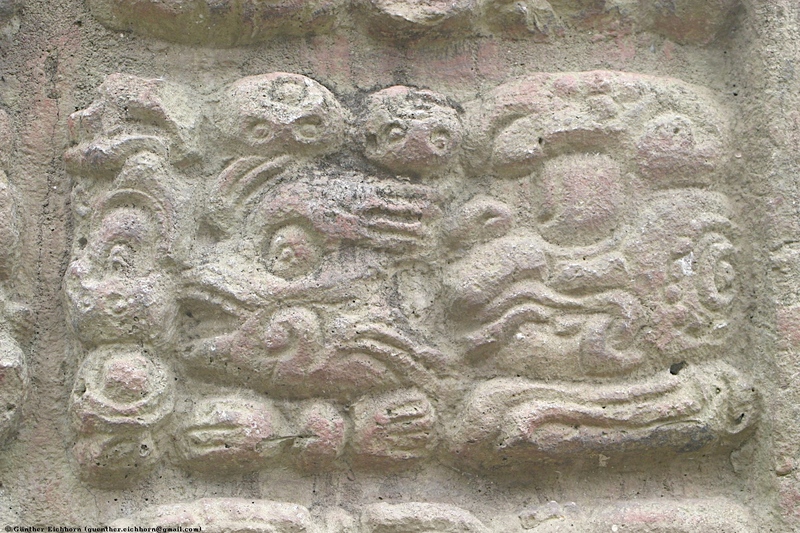 Stela C was carved to commemorate the first k'atun ending after the accession of the 13th ruler of Copán, Waxaklajuun Ub'aah K'awiil (18 Rabbit) on Long Count 9.14.0.0.0 (December 5, 711 CE). 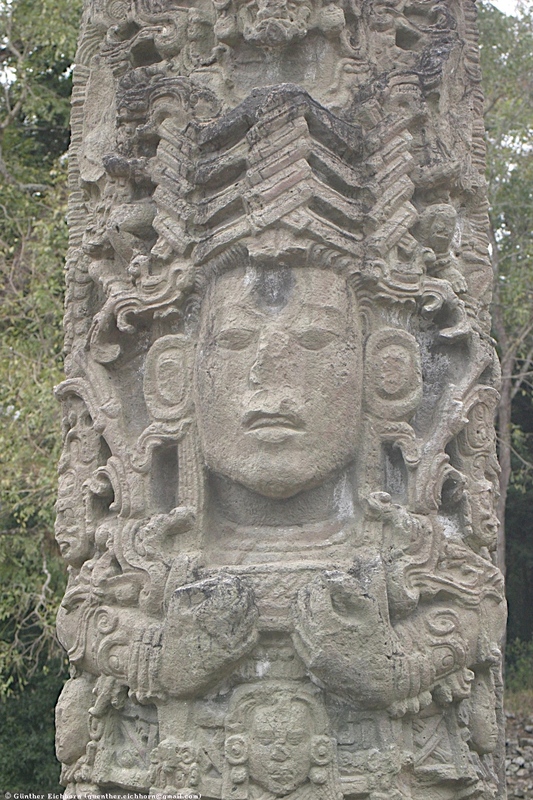 It is carved on both sides so that it he is facing both the rising and setting sun. 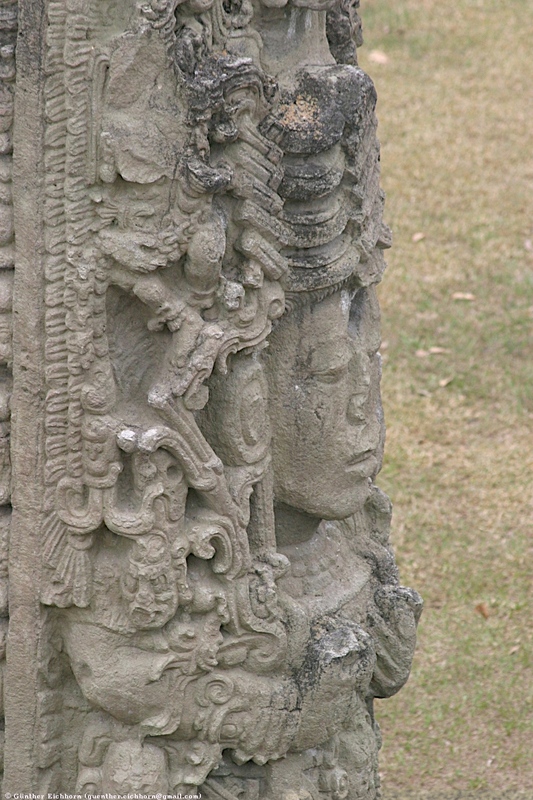 The two faces show a young face on the east side and an old face on the west side. 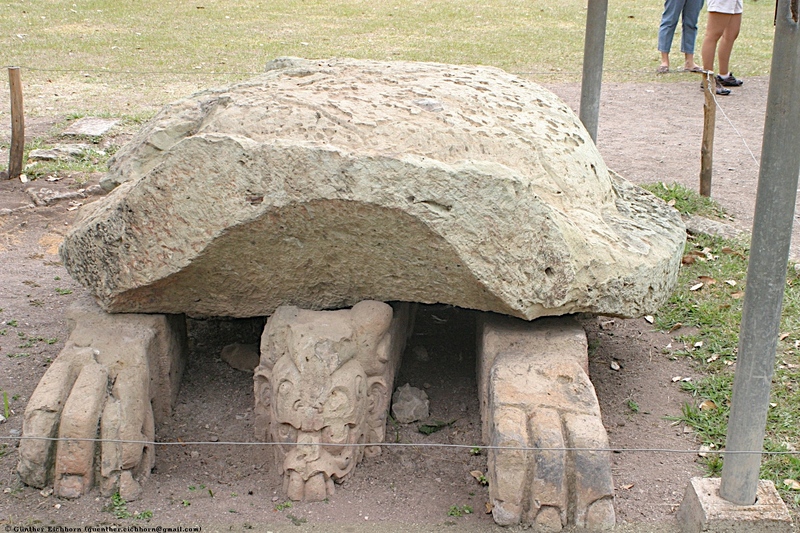 On the west side of Stela C is a turtle shaped altar known as the Cosmic Turtle. 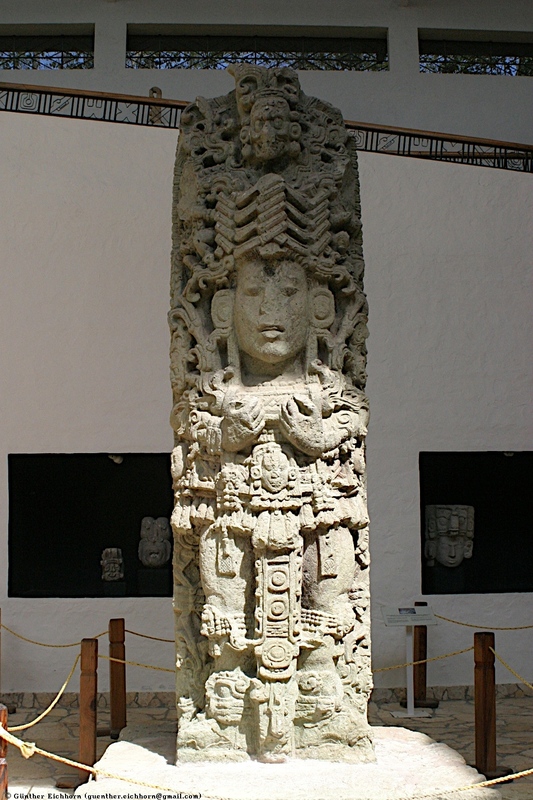 Stela D is also located in in the Plaza de las Estellas. 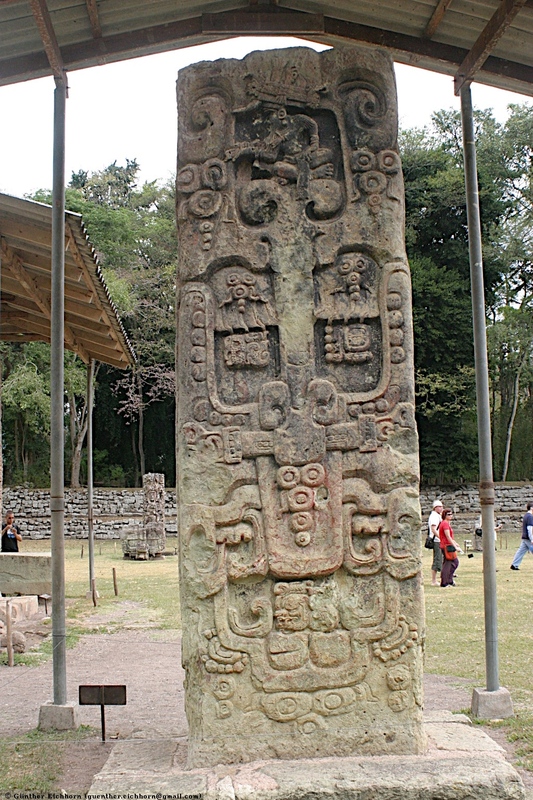 It too was build by Waxaklajuun Ub'aah K'awiil (18 Rabbit), in 736 CE, a few years after Stelae A and B. 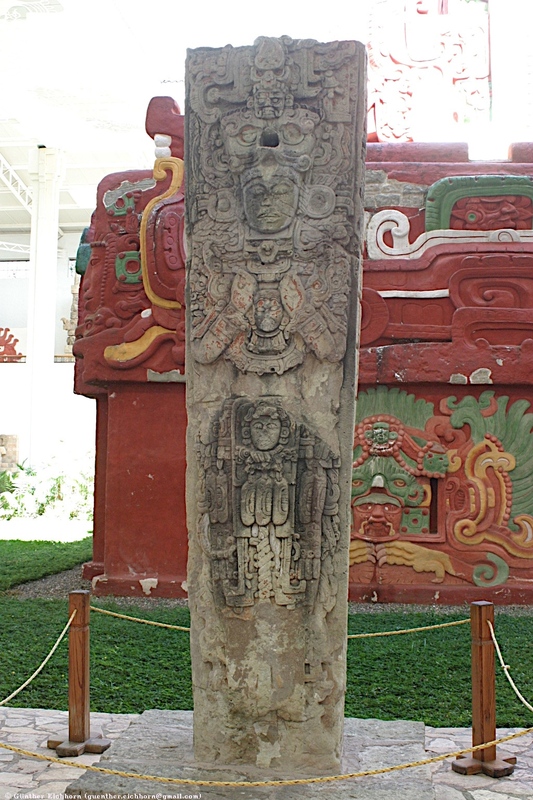 It was dedicated on the hotun of the cycle that began with Stela B. It was the final stone monument of the great king who raised it. 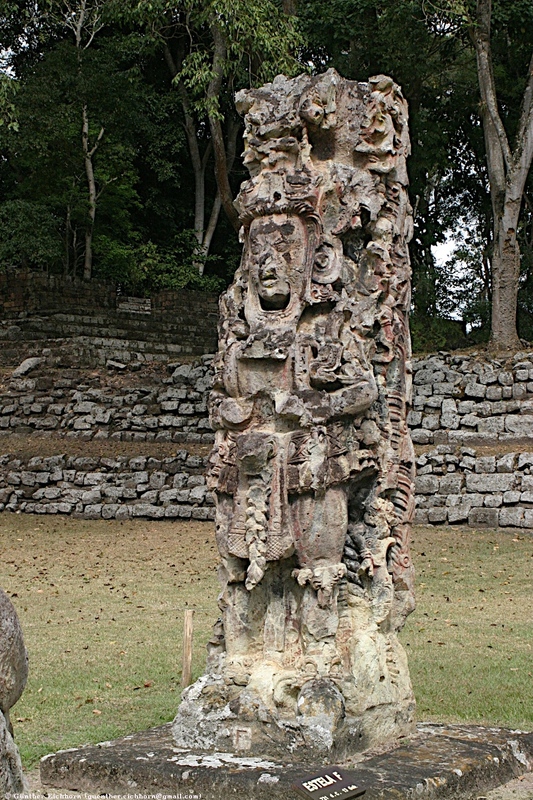 Standing at the base of Temple 2, it is the northern stela of the Great Plaza and faces south toward the north stairway of Temple 4. Its eloquent imagery presents 18-Rabbit in the guise of an old God. The ruler wears an actual mask that covers the greater part of his face, with large oval openings left around his eyes and mouth so that the viewer can identify him within his disguise. 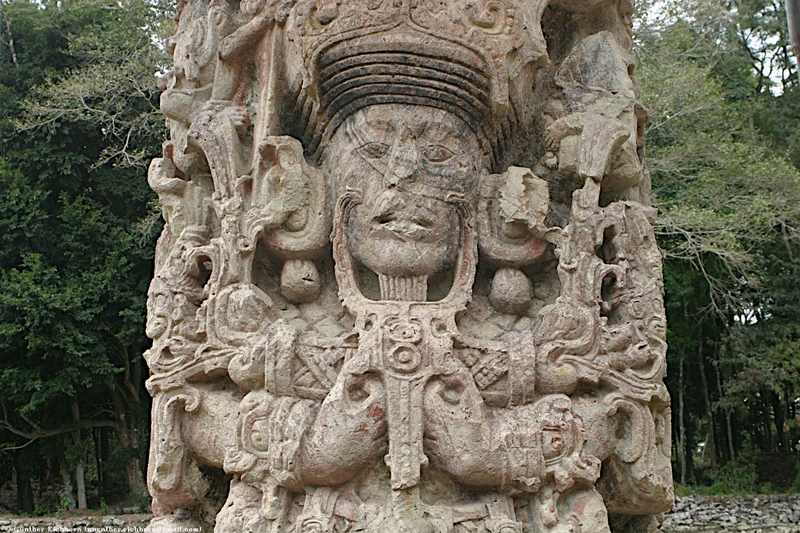 This is a "very un-diagnostic mask," although it may represent the old sun God. The mask has the features of an aged face, with prominently sagging jowls, wrinkles that surround the lips, and nearly toothless gums. 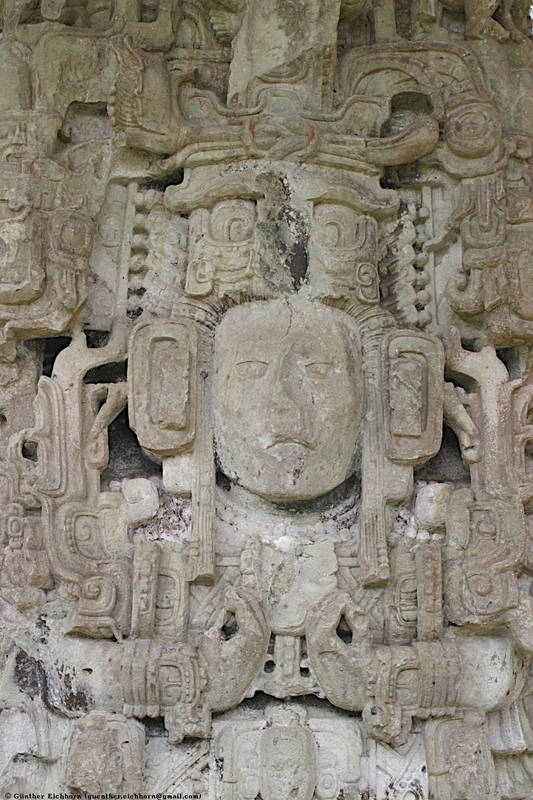 An oval cartouche that fills the forehead of the mask probably held a mirror sign for brightness. 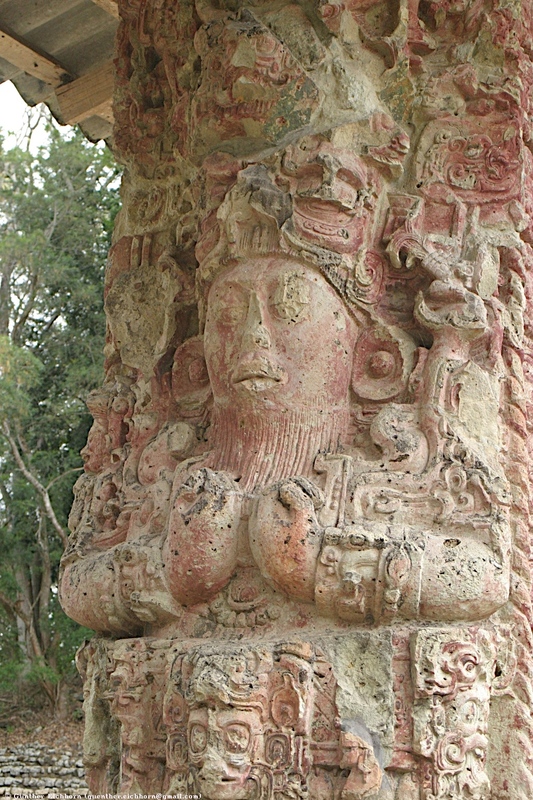 A short, squarish length of beard like that which 18 Rabbit wears on Stela B seems to be part of the mask. The king's hair flares away from his face, falling in long locks just in front of his ear spools. 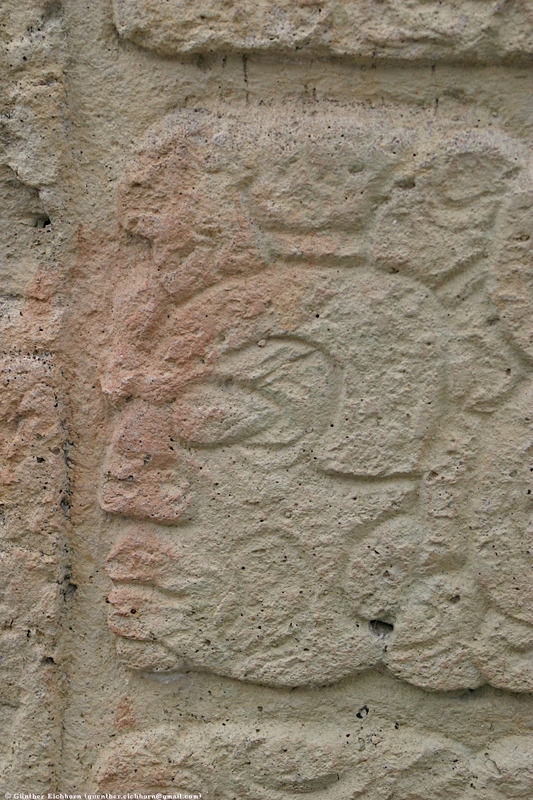 Stela E is also located in in the Plaza de las Estellas. 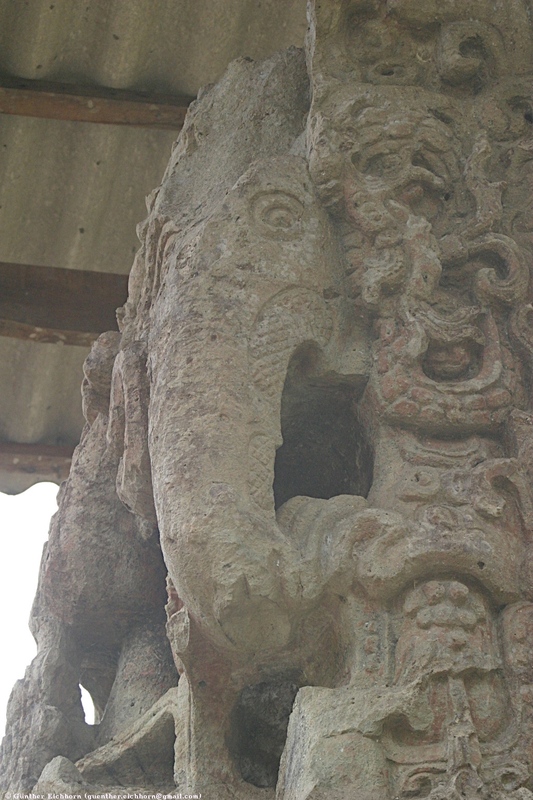 It is on top of the stairs of Temple 1. 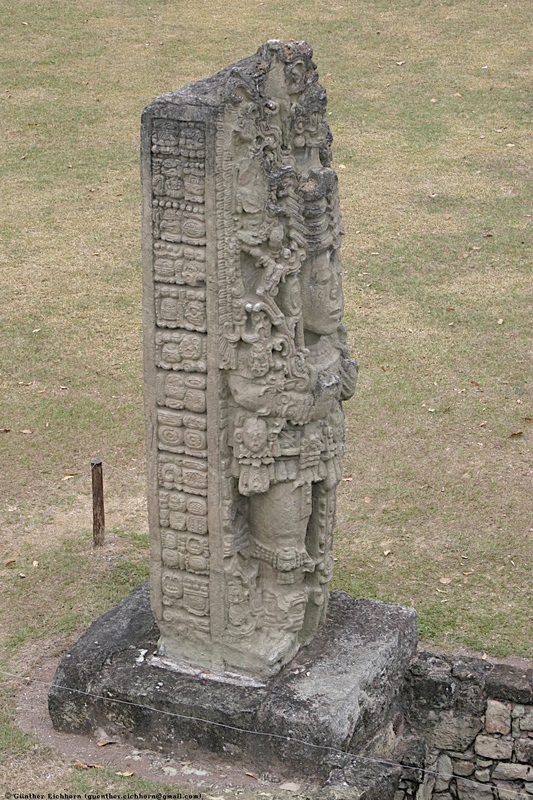 It is one of the oldest Stelae, from around 614 CE. 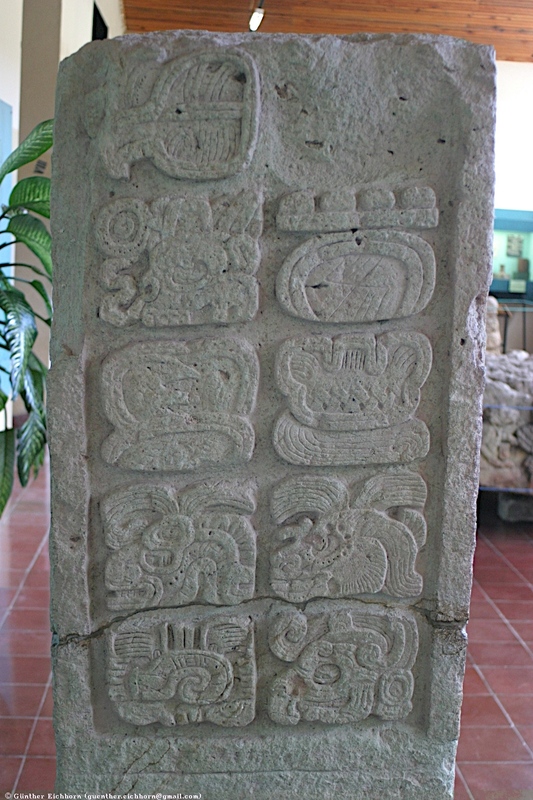 Stela F is also located in in the Plaza de las Estellas. It was also build by Waxaklajuun Ub'aah K'awiil (18 Rabbit), but somewhat earlier, in 721 CE. 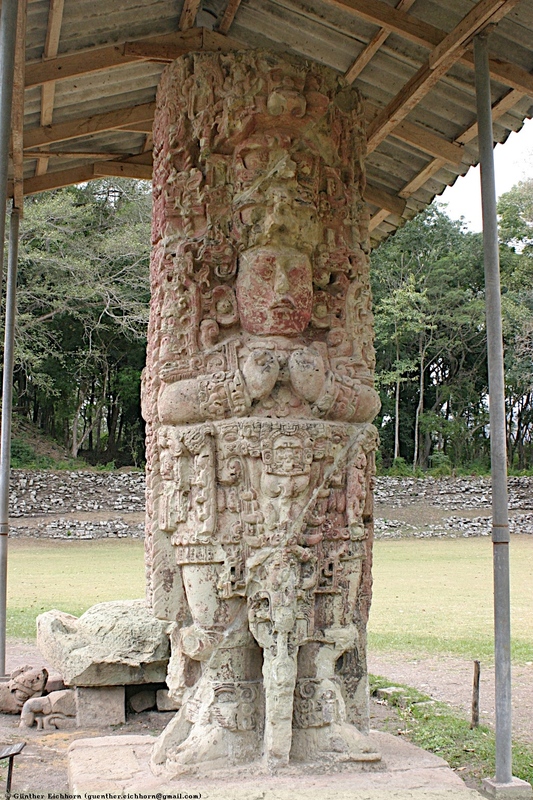 It stands north of Stela H and the three G altars on the east side of the Great Plaza. It is a masterpiece of gesture, fluid form, and finely sculpted detail. 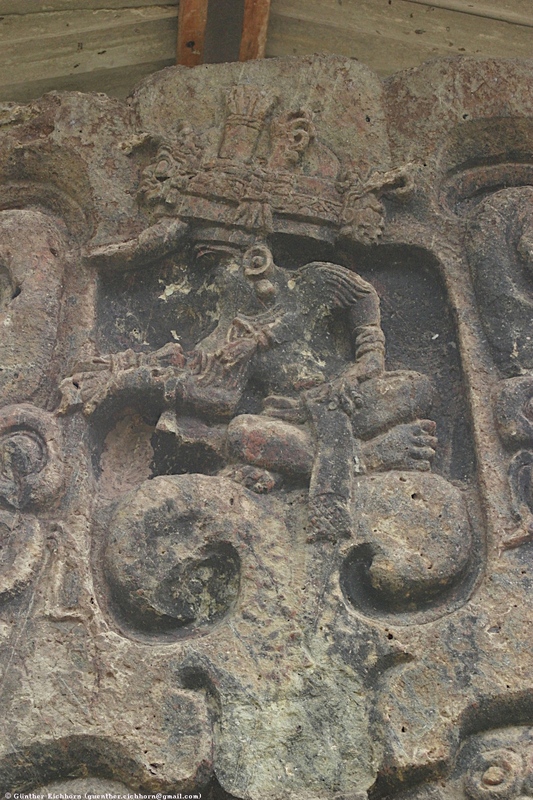 The king stands with forearms extended, cradling the serpent bar; his wrists sag and incline slightly forward to suggest the weight of his burden. Rounded contours of muscle flesh out the thighs and calves of his legs, for the king is an athlete and a warrior, a hero of battle and of the deadly matches he plays in his ball court. The belt assemblage of wood and twisted matting or leather that binds his waist resembles the heavy belts used by ballplayers to strike the ball and protect their torsos from its impact. The ruler's feet, shod in high-backed sandals, are firmly braced to support the weight of his muscular body and the belt, headdress, and tall back-rack he wears. 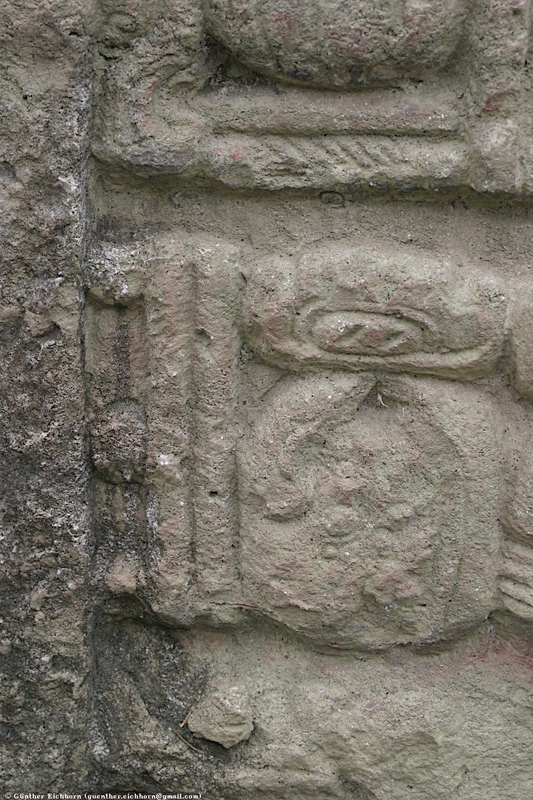 Altar G is also located in in the Plaza de las Estellas. 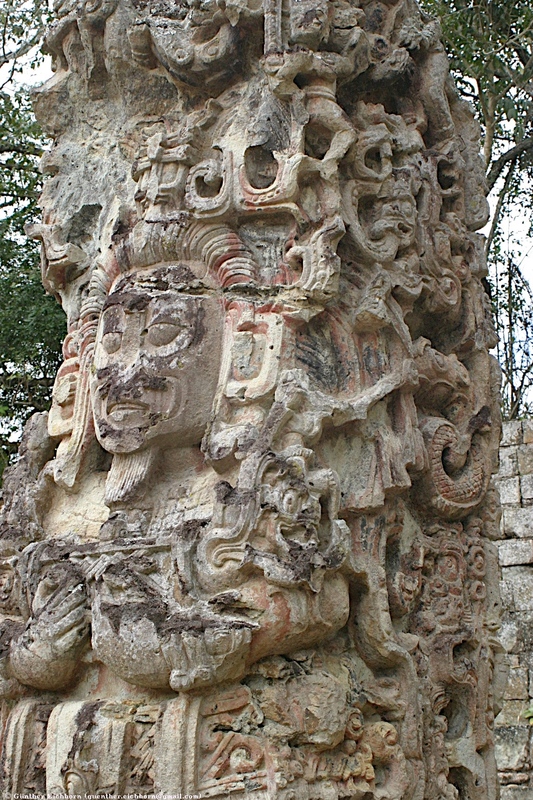 It is actually a group of three altars, named G1, G2, and G3, each depicting the Maya God Kukulcan, the feathered serpent. 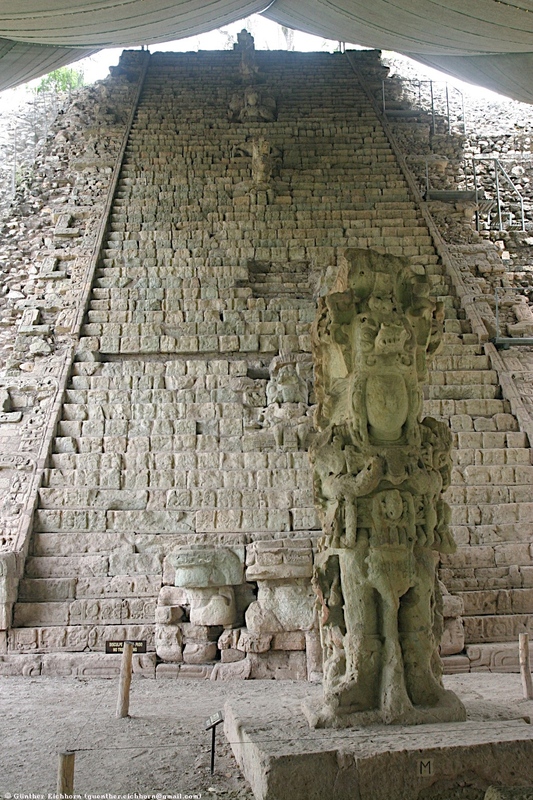 With Altar G1 the triangular portal was completed in the ceremonial center commissioned by Waxaklajuun Ub'aah K'awiil (18 Rabbit), the 13th ruler of Copán on Long Count 9.18.10.0.0, Calendar Round 10 Ajaw 8 Sak' during the middle of the 9th K'atun (766 CE). 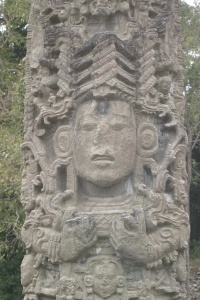 This was one of the last monuments carved at Copán. 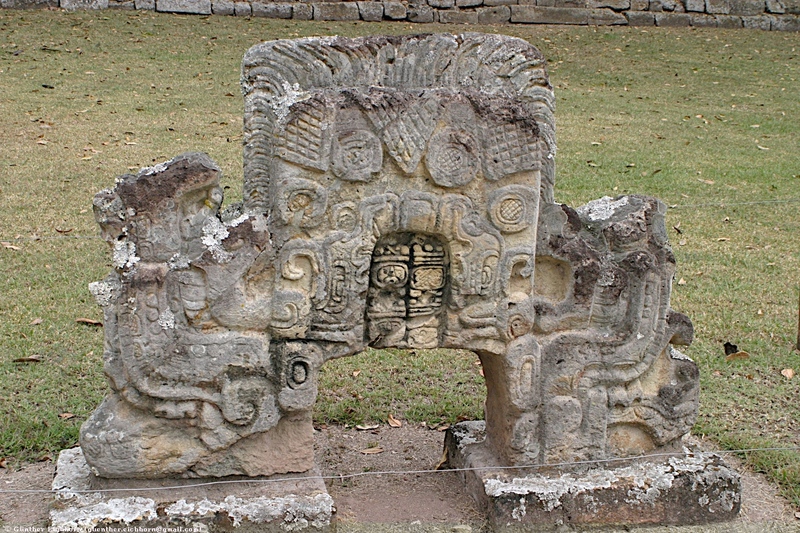 This altar confirmed the political duality that united Yax Pasaj Chaan Yoaat (Yax Pac) with his half brother Yahau Chan Ah Bac. 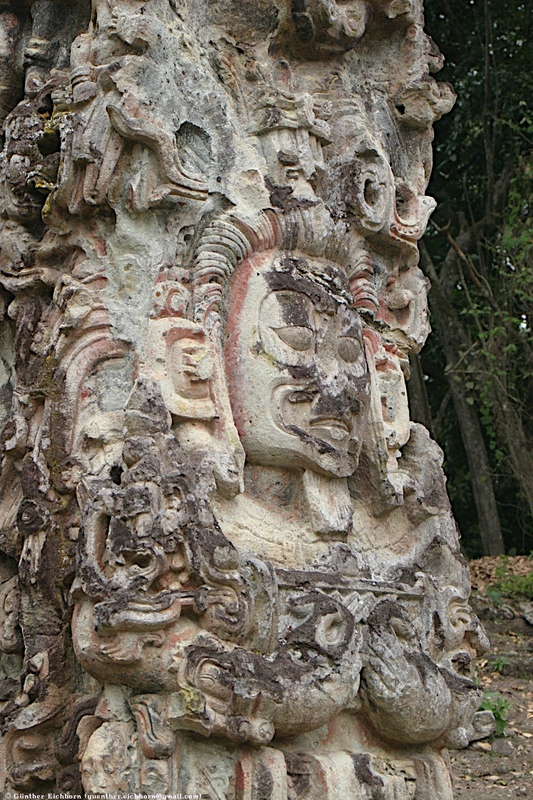 This altar is also known as na-chan by the locals and holds a two-headed image of the Cosmic Monster, one side in skeletal form signifying death and a living form on the other signifying rebirth. 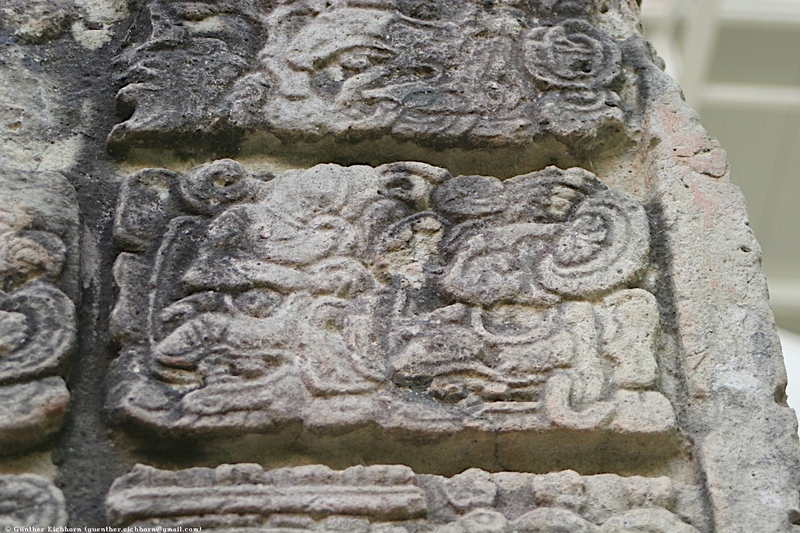 A special text appears at each side of the body; on the north side it reads "in the land of Yax Pasaj Chaan Yoaat", on the south side is the glyph for "Yahau Chan Ah Bac", who is emerging from the body. 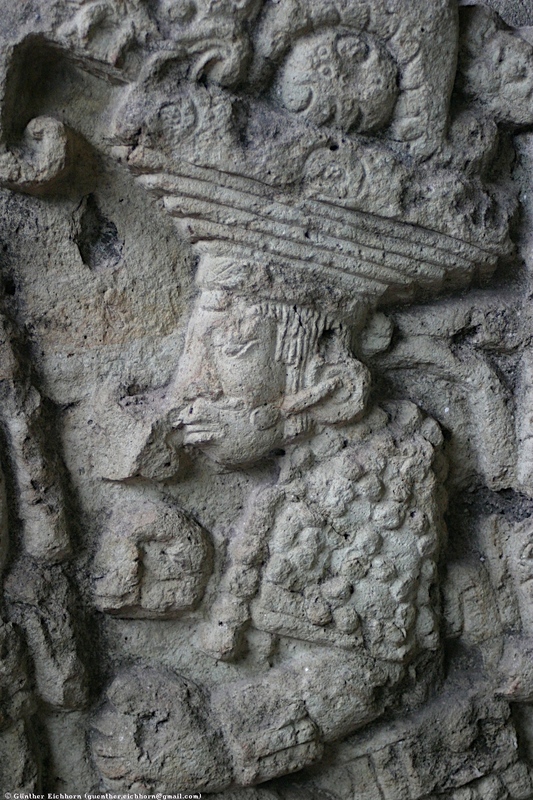 This engraving of a non- king in a public monument gave the half brother the role of protagonist in the political affairs of Copán. 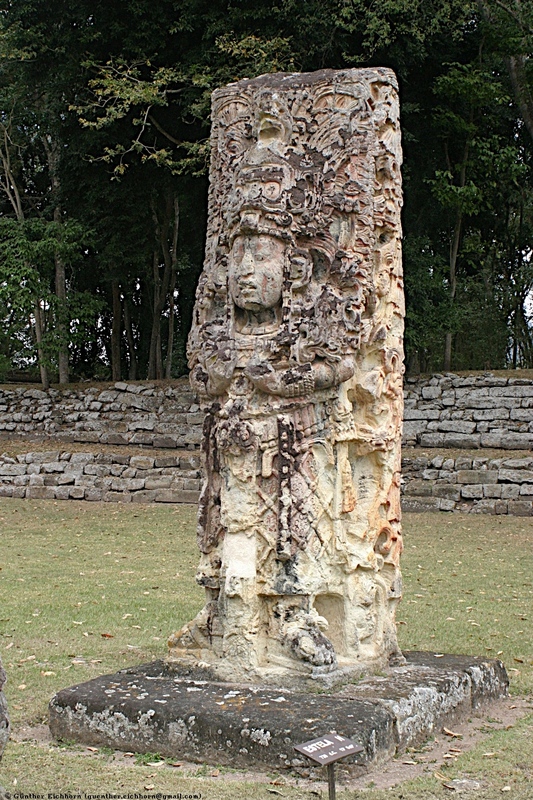 Stela H is also located in in the Plaza de las Estellas. 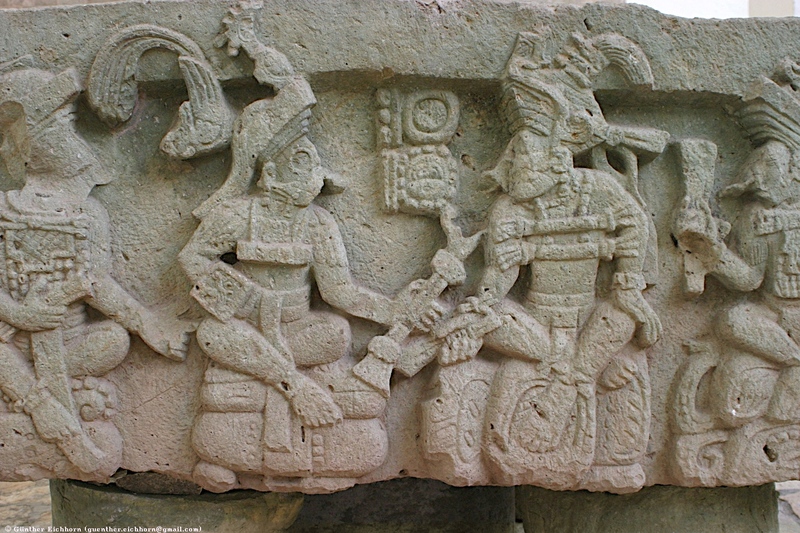 It was dedicated on Long Count 9.14.19.5.0 (Calendar Round 4 Ajaw 18 Muwan'), 1 December, 730 CE and shows the 13th ruler of Copán, Waxaklajuun Ub'aah K'awiil (18 Rabbit) in the role of the Maize God as he danced at Creation. 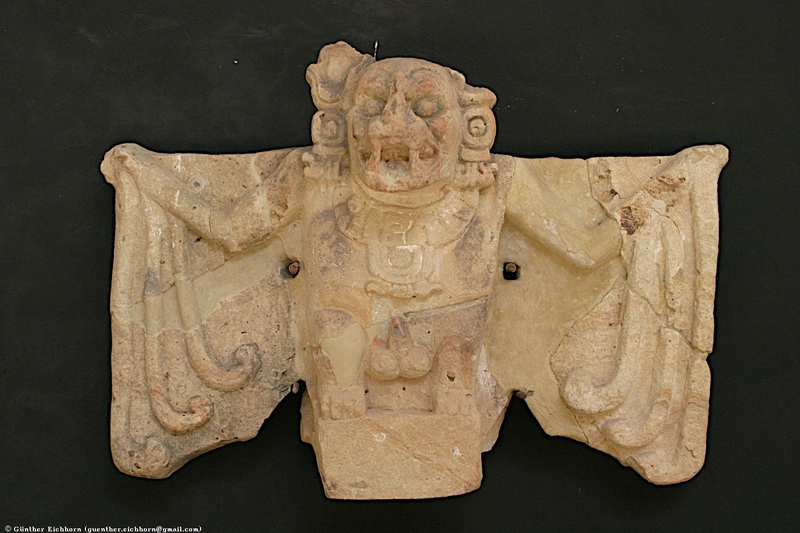 In the Classic-period story of Creation, the Maize Gods are the central characters in the drama that explains the processes of death and rebirth through confrontation with the Lords of Death in Xibalba. 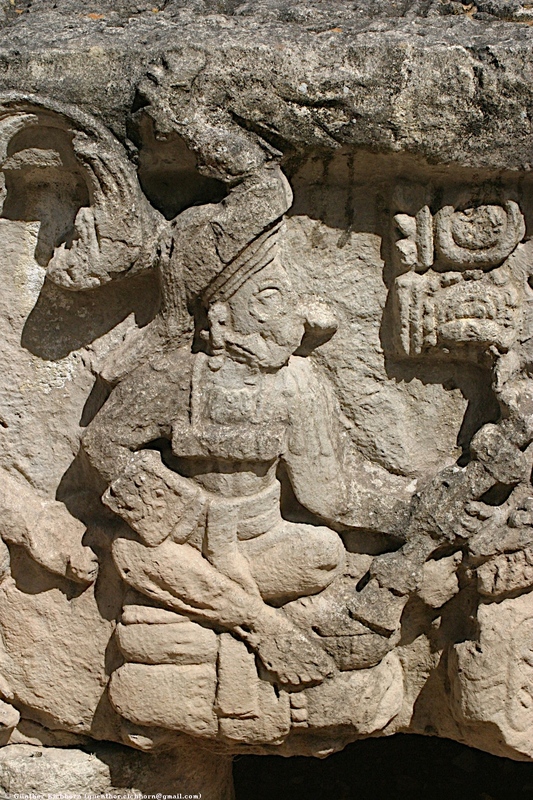 Classic-period imagery shows the Maize Gods being reborn from a snake, growing from infancy to adulthood, and being dressed in full regalia by beautiful young women. 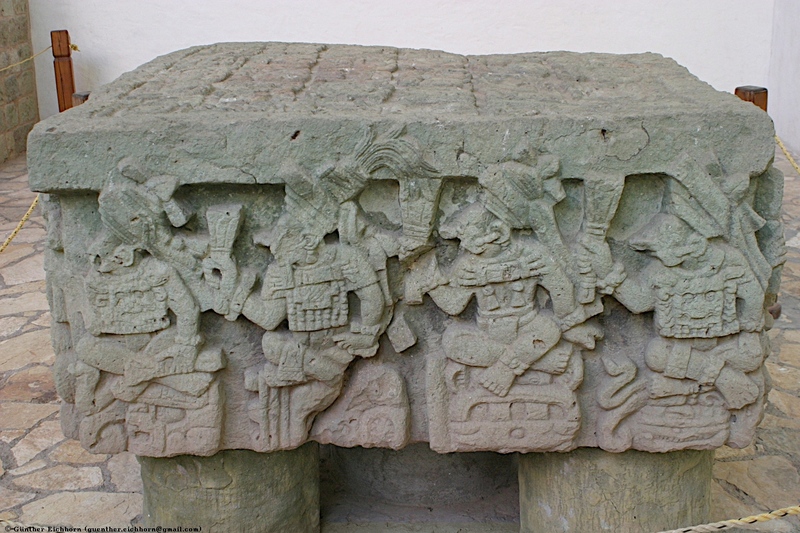 This regalia included a net skirt, a fish monster-and-shell belt, and a huge back rack carrying one of three animals who would become the Throne Stones of the Cosmic Hearth. Once fully dressed, the Maize Gods danced in the company of dwarfs and began the activities that led to the Fourth Creation. 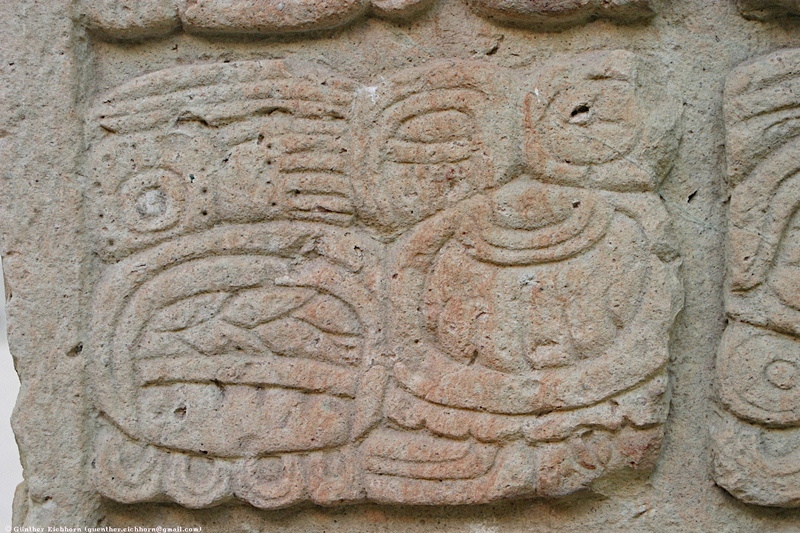 Waxaklajuun Ub'aah K'awiil reenacts this dance on Stela H, and to reinforce his identity, he wears a huge zoomorphic Maize God headdress with the leaves and ear of the plant arching over his head. 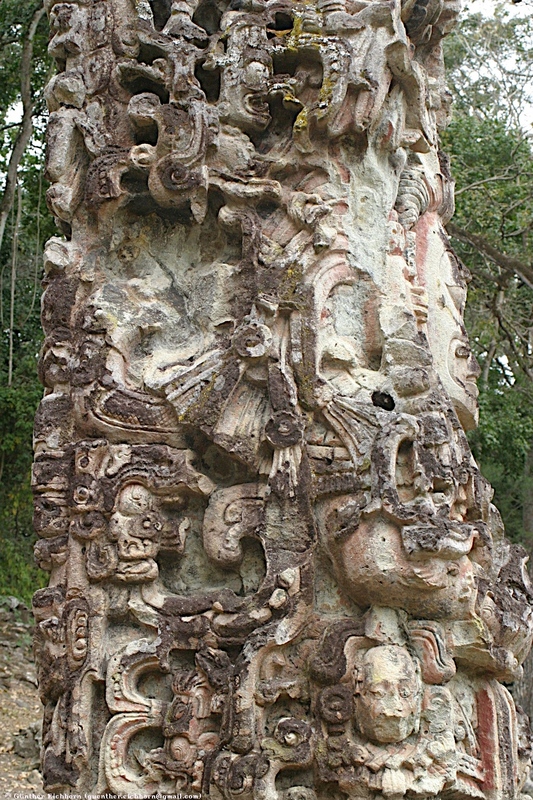 Stela I is also located in in the Plaza de las Estellas. 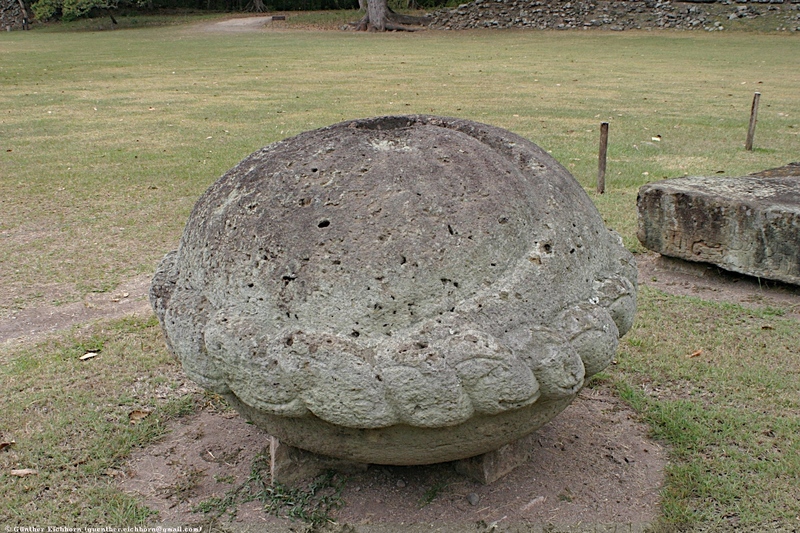 Stela I records early dates: Long Count 8.6.0.0.0, Calendar Round 10 Ajaw 13 Ch'en (160 CE) and Long Count 8.6.0.10.8, Calendar Round 10 Lamat 16 Pop (161 CE), in connection with some political event like foundation. It seems to refer to somebody that was associated with another place. 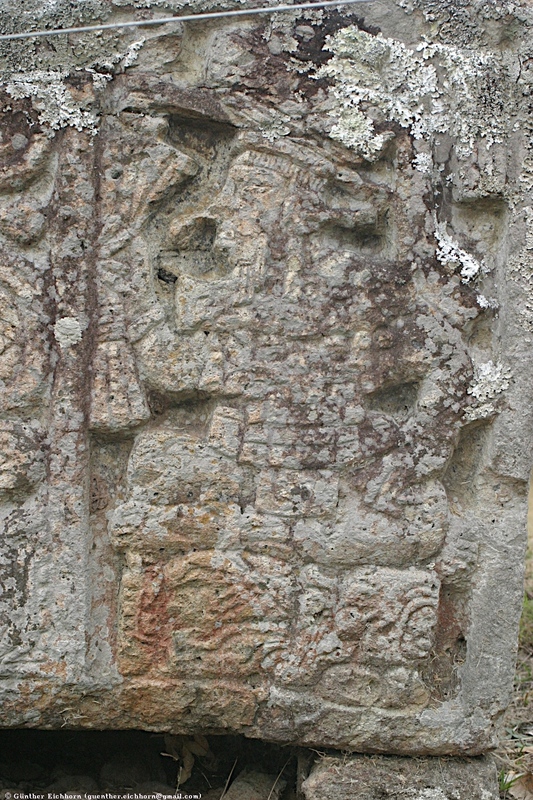 The figure seems to depict not a ruler but somebody important from somewhere else. 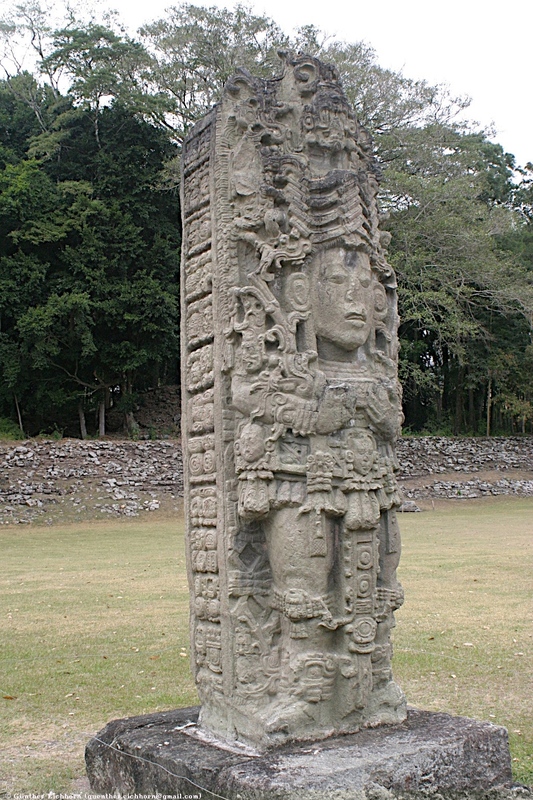 The Stela itself may be from 692 CE, it was build under Chan Imix K'awiil or Smoke Jaguar, ruler 12. 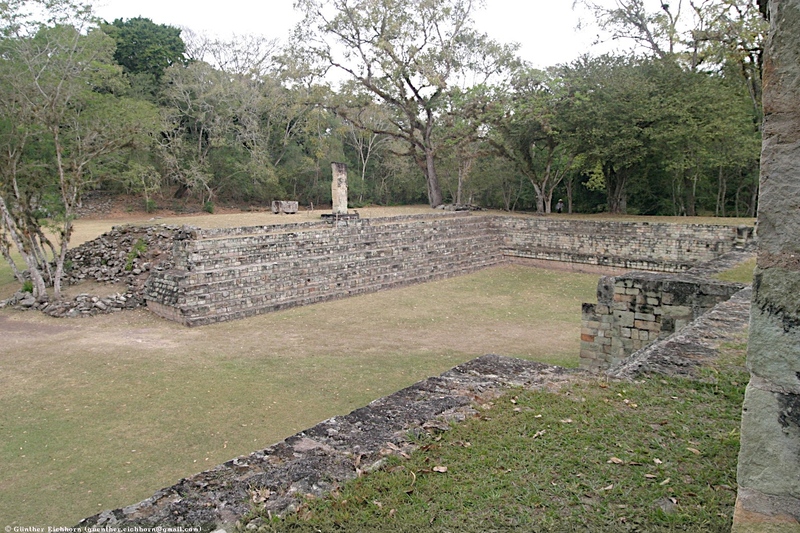 Altar L is located on top of terraces at the head of the Ball Court, next to Stela 2, but not directly associated with it. 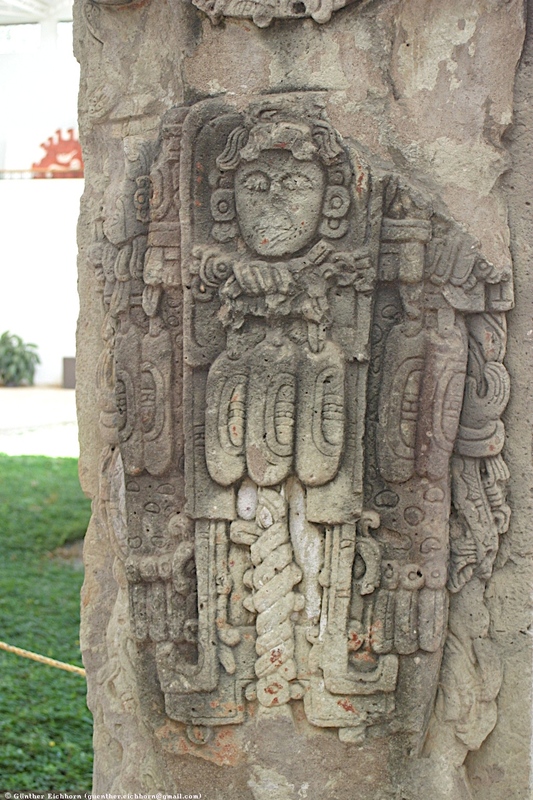 Copán's Dynasty lasted from about 465 CE to perhaps precisely 822 CE. 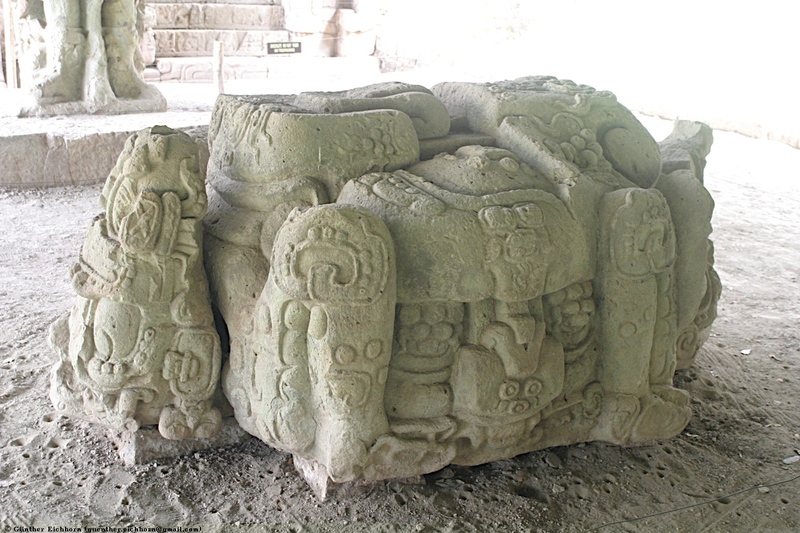 The date of the collapse is based on the texts inscribed on Altar L, a monument intended to commemorate Ukit Took', the reigning ruler who was never officially crowned. 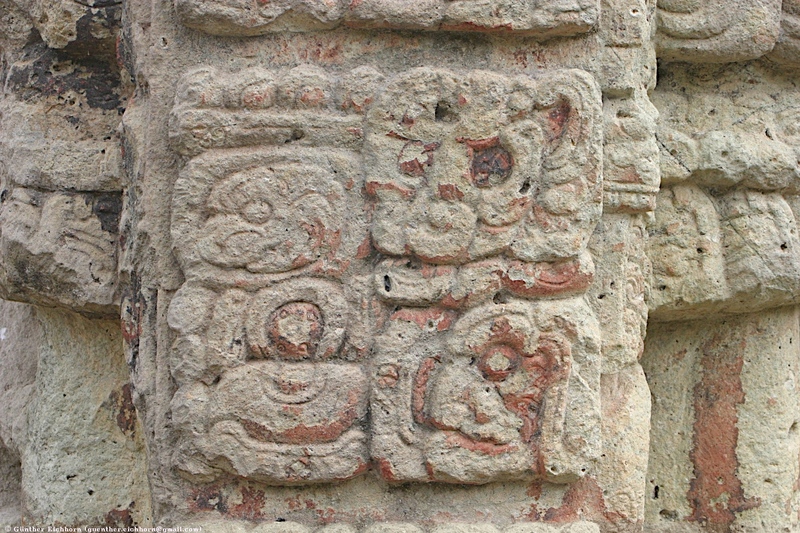 On this altar two figures are carved: the first one is that of Ukit Took' and the other is Yax Pasaj Chan Yoaat (Yax Pac). 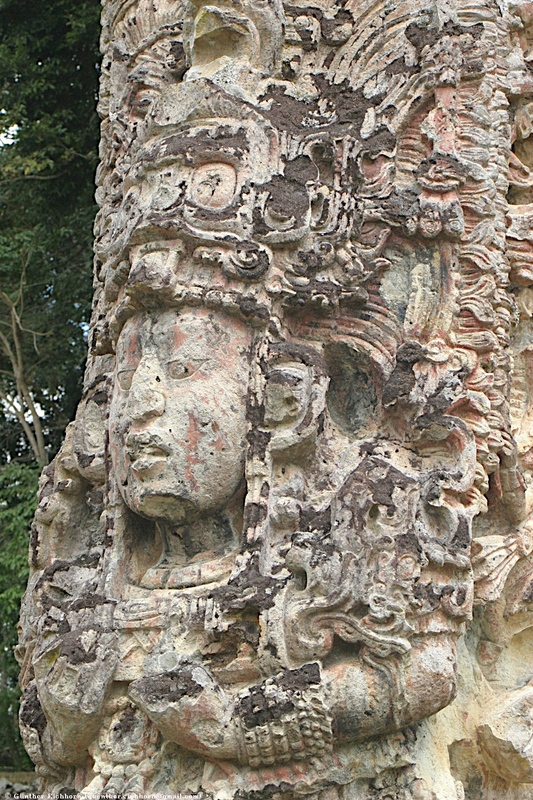 Although Yax Pasaj Chan Yoaat is the official last king of the dynasty (as seen on Altar Q ) the text on the altar clearly states Ukit Took' as succeeding him to the throne. 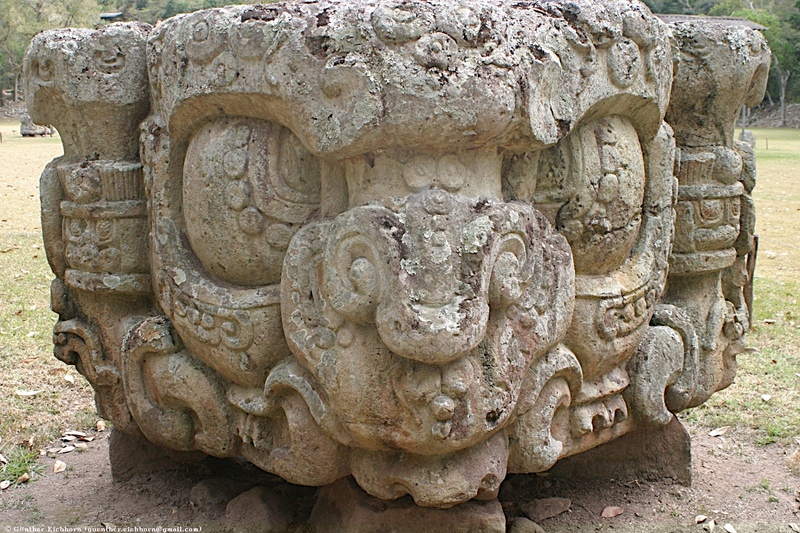 Altar L was never finished, so this points out to problems that arose suddenly around the Valley. What really did happen? 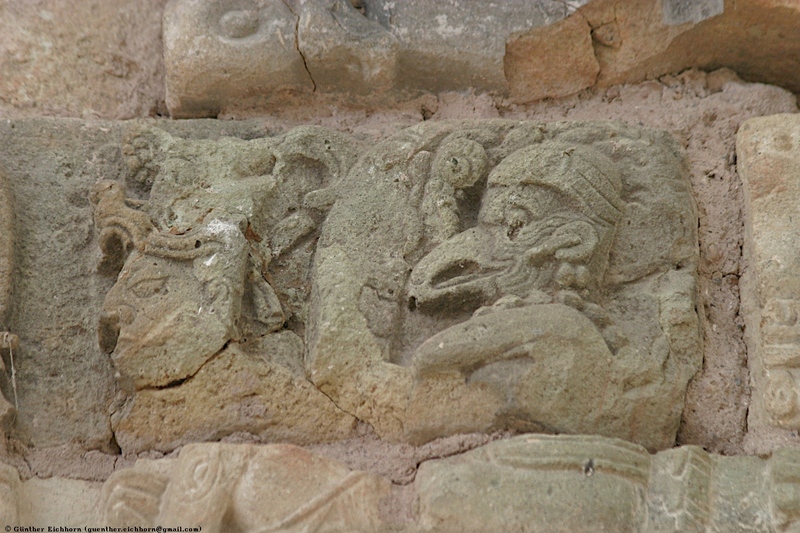 We may never know for sure, but as research advances in Copán we are getting more clues, perhaps one day we may know what happened during Copán's final hour. 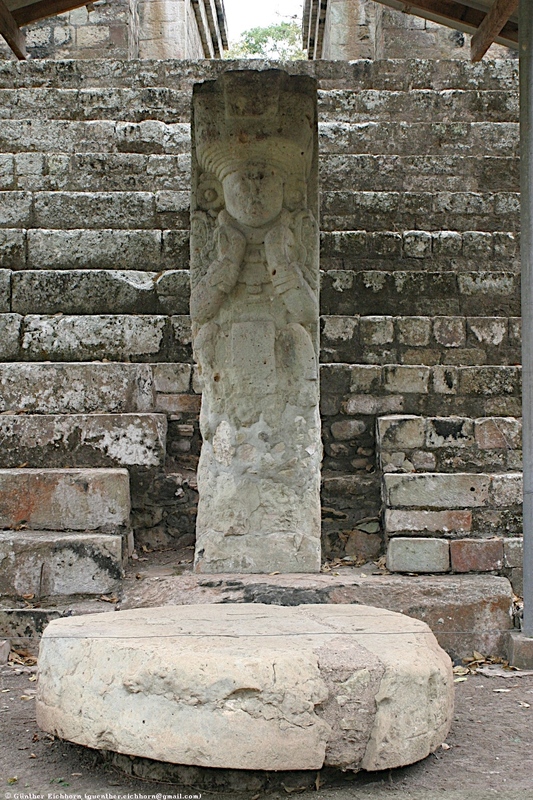 Stela M is located in front of the Hieroglyphic Stairway on Temple 26. It was dedicated by K'ak' Yipyaj Chan K'awiil (Smoke Shell). 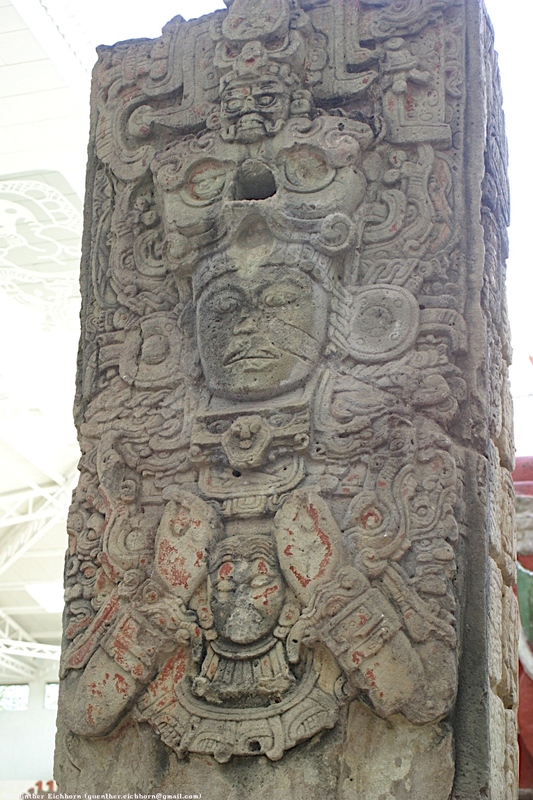 The Stela is from 756 CE. 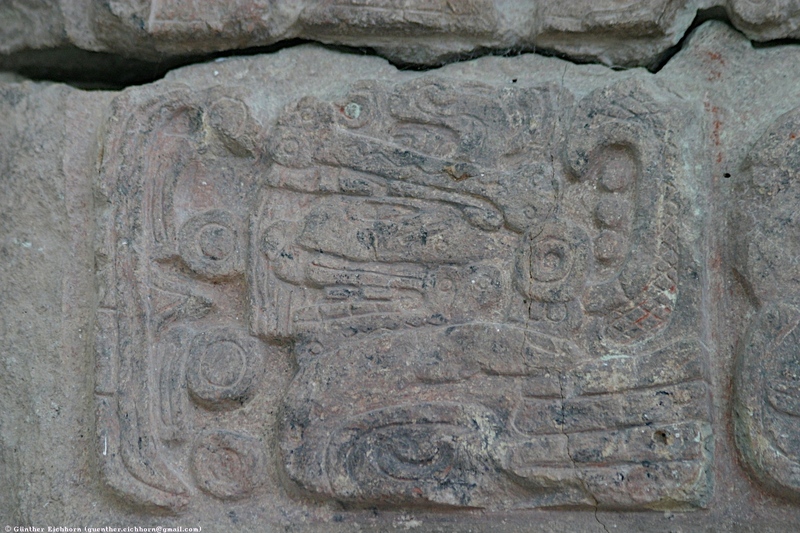 The altar of this Stela shows a plumed serpent with a human head emerging from its jaws. 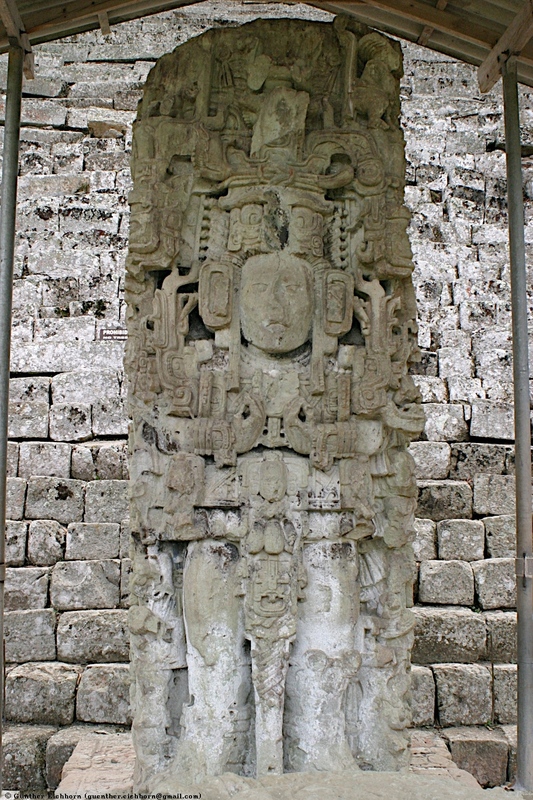 Stela N is located south of the Great Plaza, in front of the Temple 11. 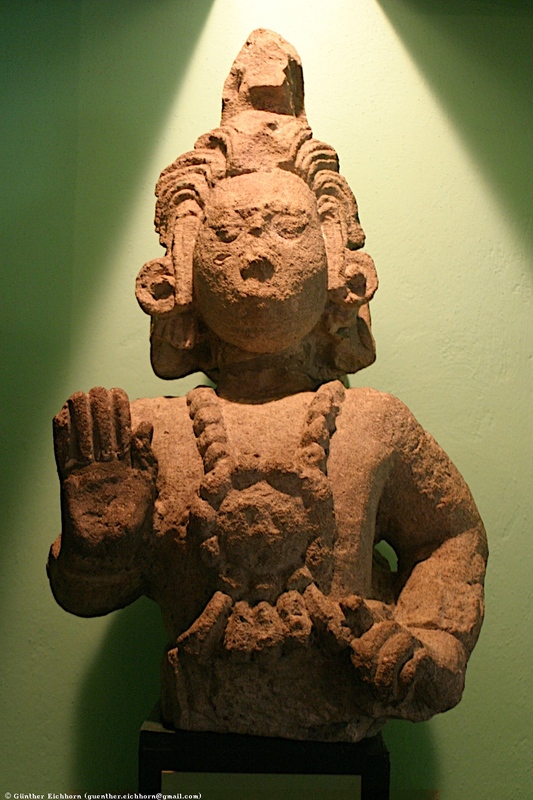 It dates to 761 CE and was erected by K'ak' Yipyaj Chan K'awiil (Smoke Shell), the 15th ruler of Copán, who ascended to the throne in 749. 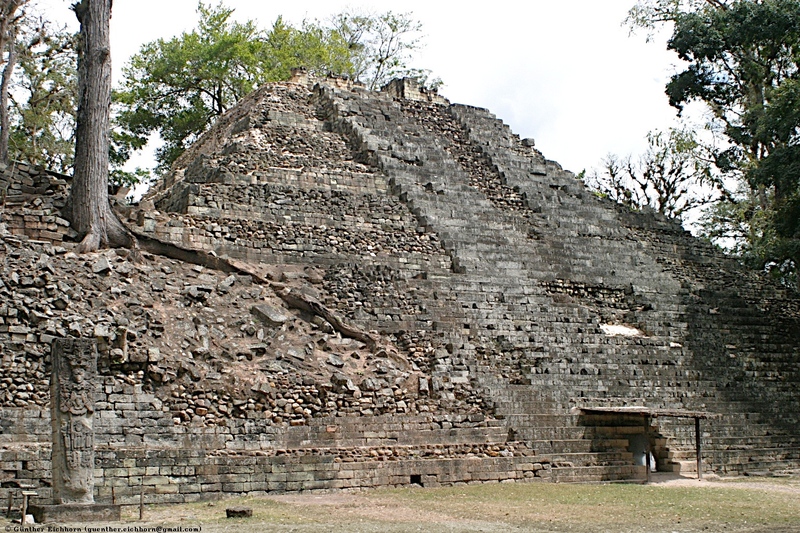 He also built the Hieroglyphic Stairway as well as Stela M at the base of the Stairway. 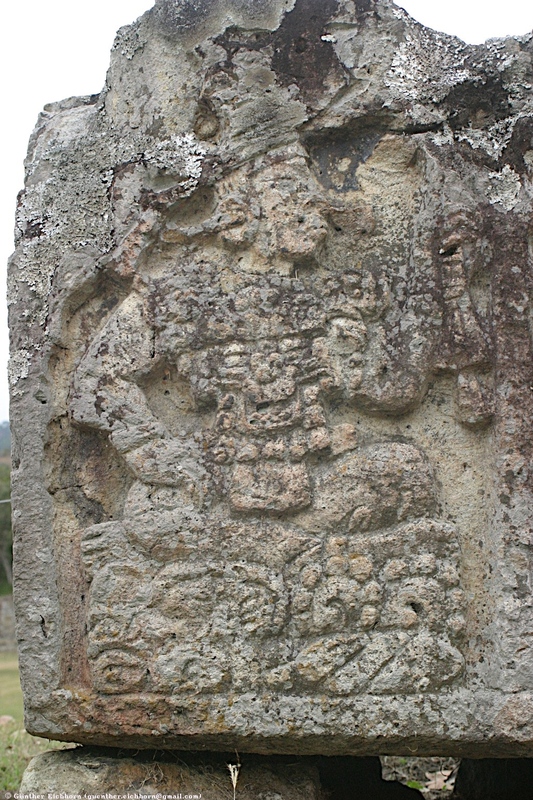 K'ak' Yipyaj Chan K'awiil was the father of Yax Pasaj Chan Yoaat (Yax Pac), the last ruler of Copán and builder of Temple 11 which stands behind this stela. 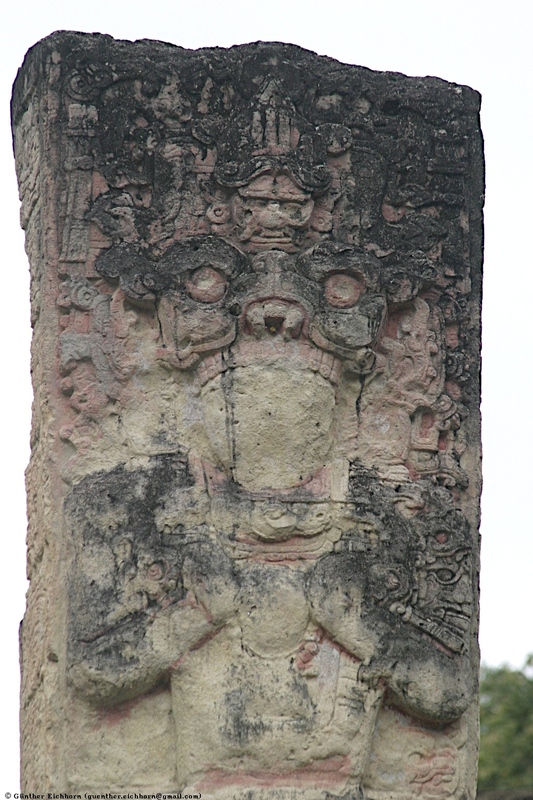 A headdress resembling a bat's face adorns the figure's head on the back side of the stela, and a column of glyphs runs down the side. 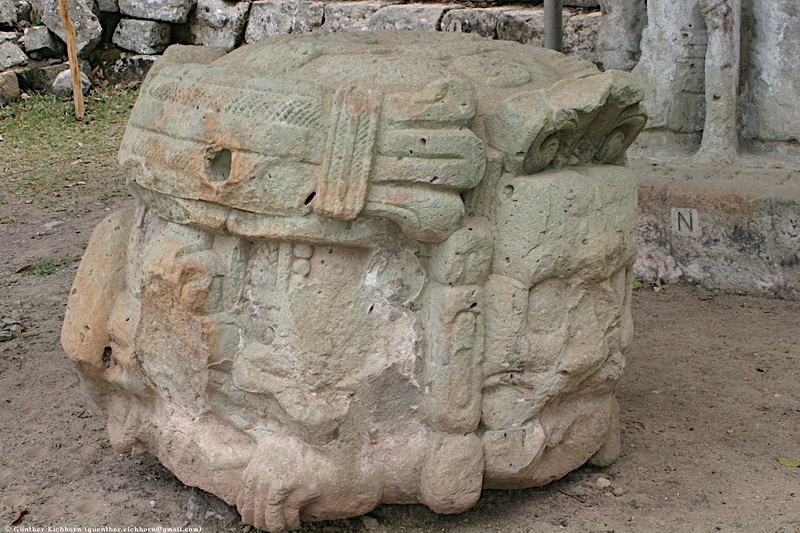 Altar O is a small altar at the base of Structure 6. 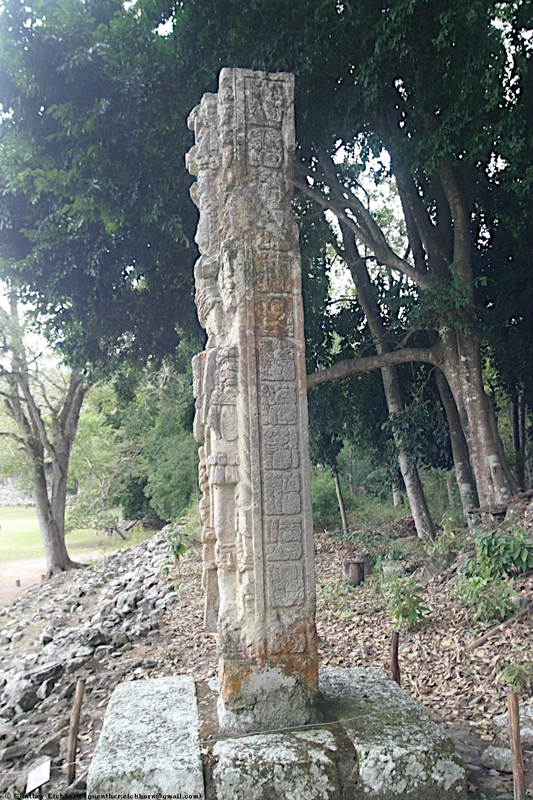 Stela P is located in the Acropolis in front of Temple 16. It shows the 11th ruler Buz' Chan. 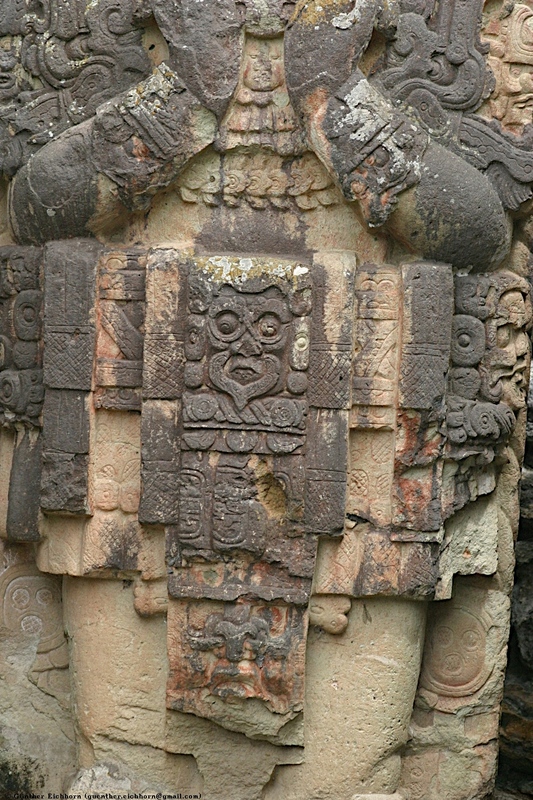 He is dressed in the royal costume of K'inich Yax K'uk' Mo', the first ruler of Copán. 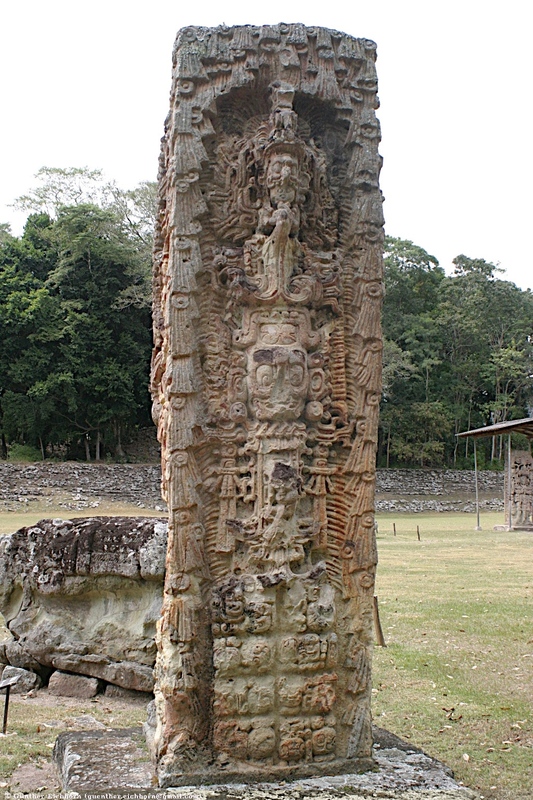 The Stela's dedication date is Long Count 9.9.10.0.0, Calendar Round 2 Ajaw 13 Pop, or 21 March 623. 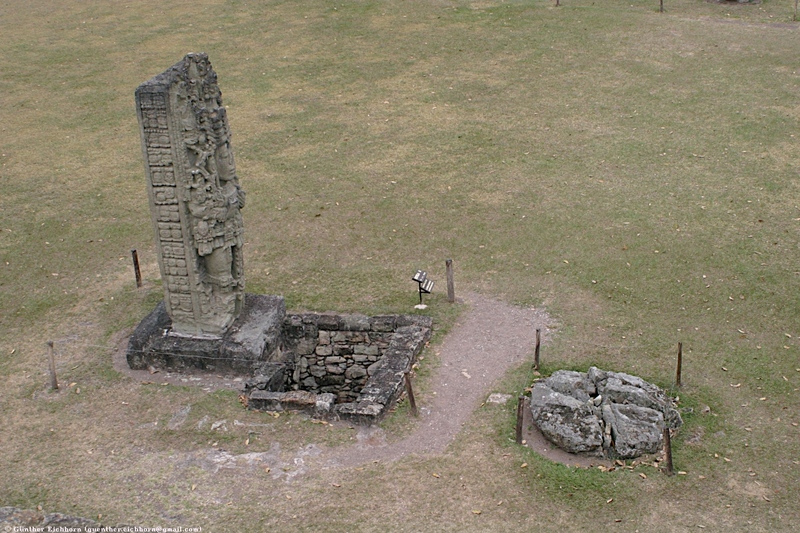 It was erected when Rosalila, the temple now covered by Temple 16, was still in use. 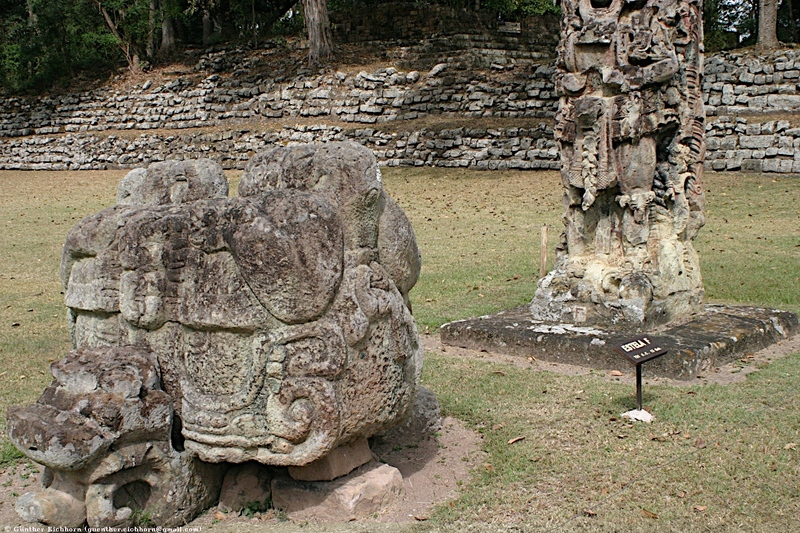 Altar Q is located in front of Temple 16. It was dedicated 27 February, 776. 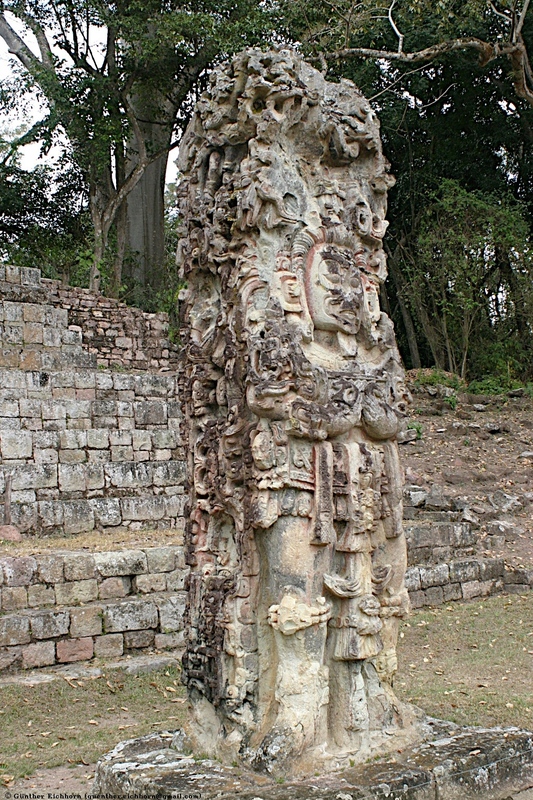 It is one of the best known sculpture masterpieces to have been carved in Copán. 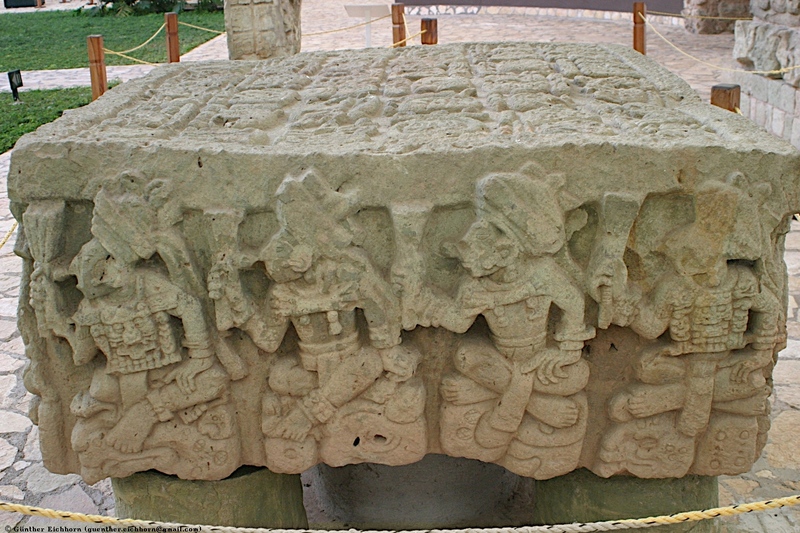 Carved on this Altar are the representations and names of the 16 dynastic rulers of Copán from 426 CE to around 822 CE (see Maya ruler genealogy). Starting the sequence is the founder of the dynasty Yax K'uk' Mo' who is seen giving the staff of office to the king who commissioned this altar, Yax Pasaj Chaan Yoaat (Yax Pac). The date shown between the two is Calendar Round 6 Kab'an 10 Mol, 2 July 763 CE, the year of the accession of Yax Pasaj. This is basically a public display of legitimization of power. 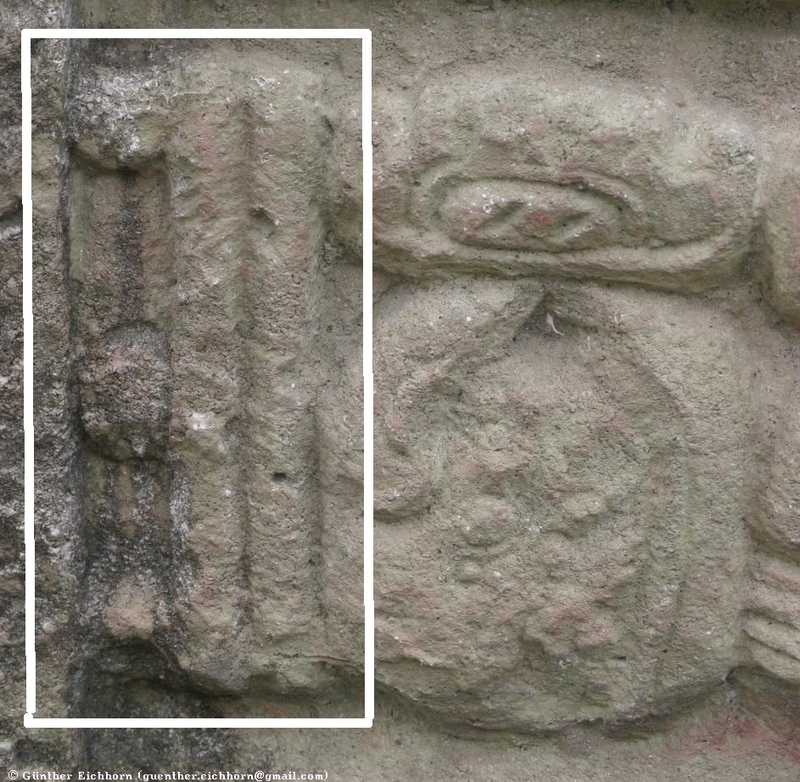 You can see the numbers for the date in the hieroglyphs between the two rulers in the closeup view of the date below. The top hieroglyph shows the number 6 (one dot and one bar) for 6 Kab'an. It has three dots, but the two outer ones have pieces cut out. They are shown only for balance, one single dot would not look good. 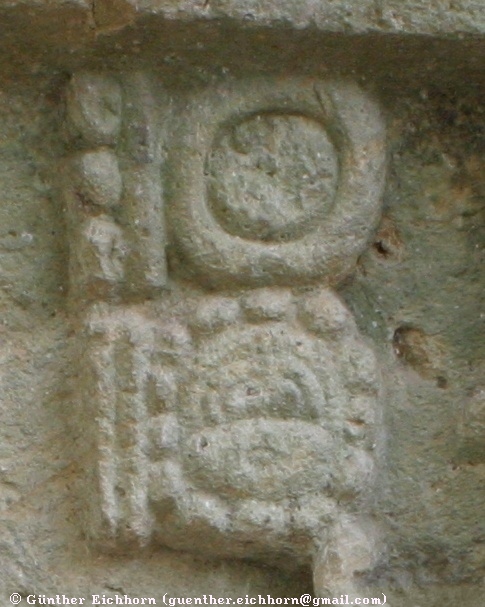 The lower hieroglyph shows the number 10 (two bars) for 10 Mol. 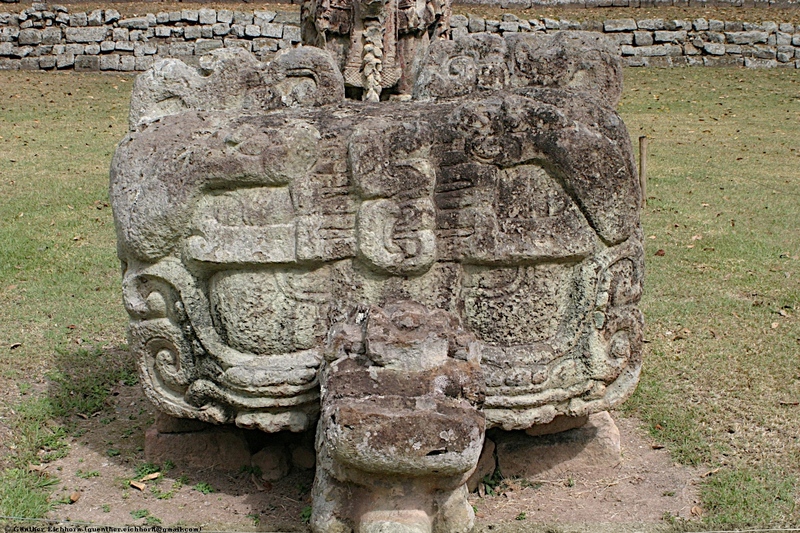 On the four faces of the altar are in sequence the other fourteen recognized rulers of the dynasty, each one sitting on a glyph with his respective name. Some of these rulers are quite well known, while about others there isn't much information at all. 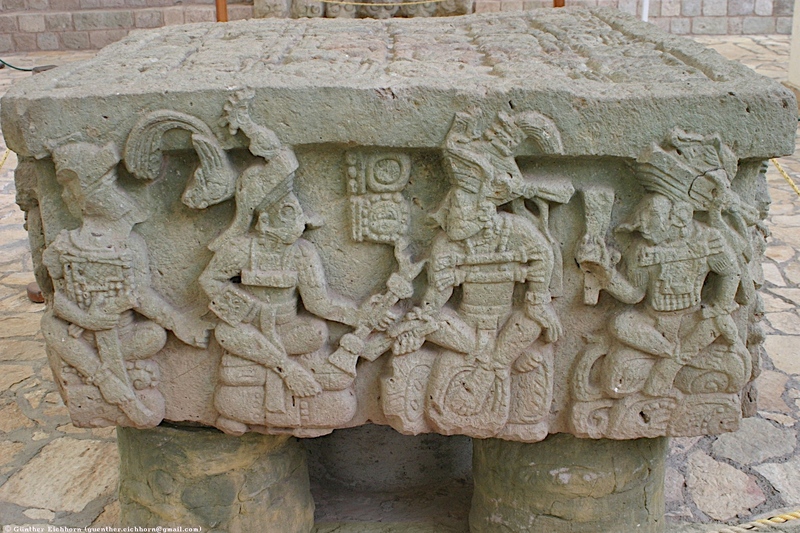 From some of these rulers the only thing we have is the glyph they are sitting on, this could be due to the fact that any sculpture or architecture that bore their name, deeds, or dates of ascension or period termination were destroyed, reused or recycled as monument fill for monumental architecture of later kings, as per the Maya's tradition. 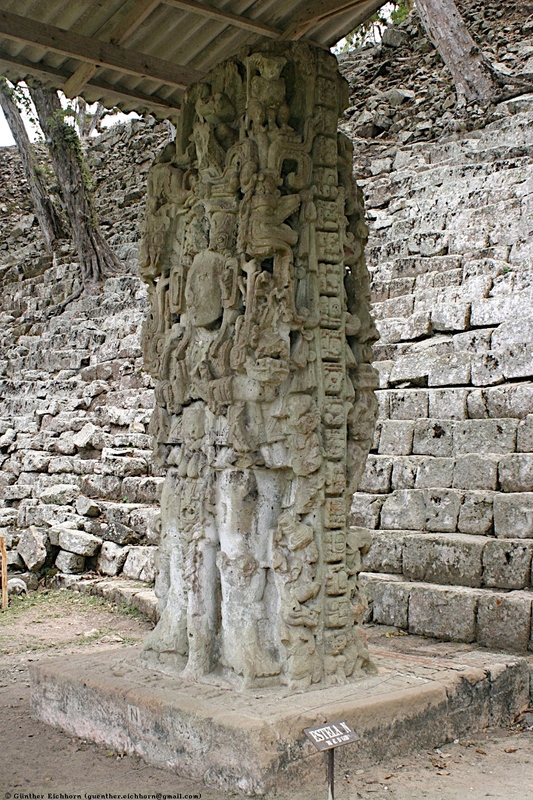 The original of this altar is in the Sculpture Museum, in the Acropolis is a replica. 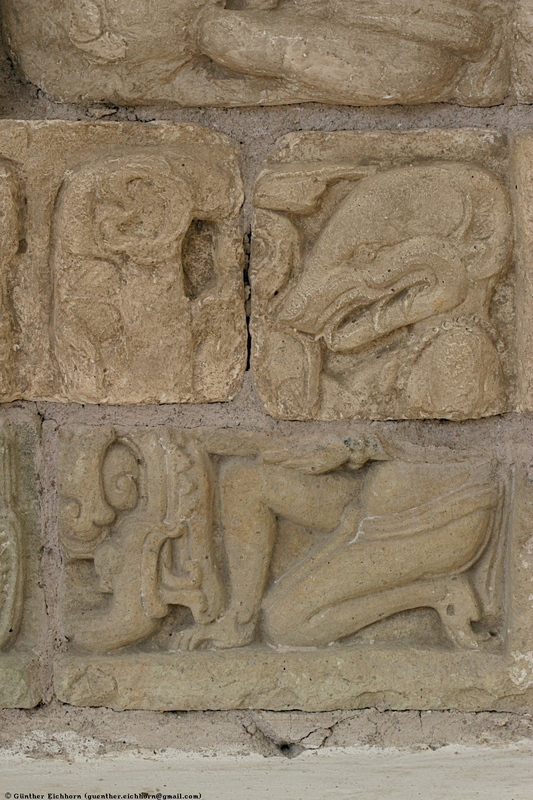 The original of Altar T is in the Museo Regional de Arqueología in Copán Ruínas. 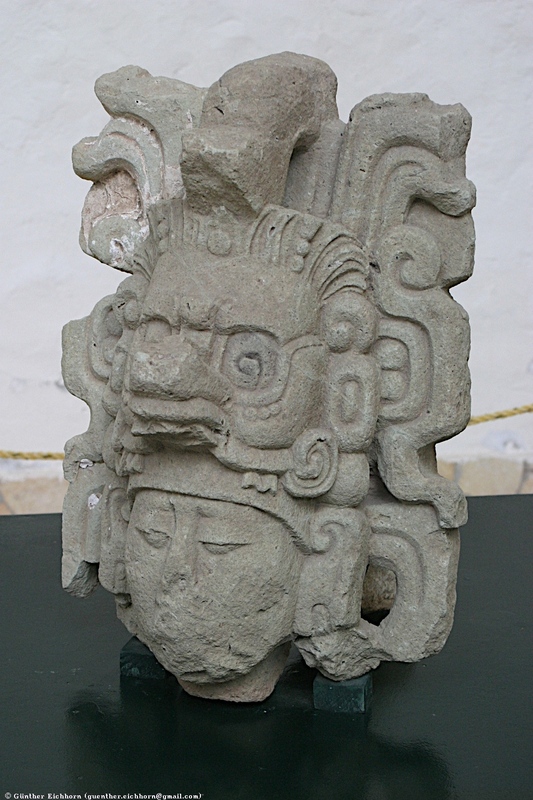 It commemorates the end of the first k'atun (7200 days, about years) after the accession to the throne of Yax Pasaj Chan Yoaat (Yax Pac), the 16th ruler of Copán, at 783 CE. 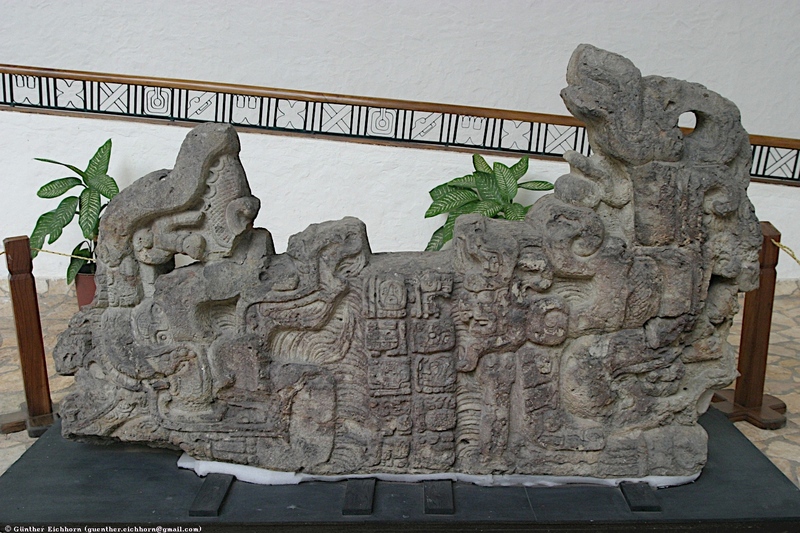 Atop the monolithic altar the eroded relief remains of a great crocodile, outstretched afloat in a sea of fish and waterlilies. 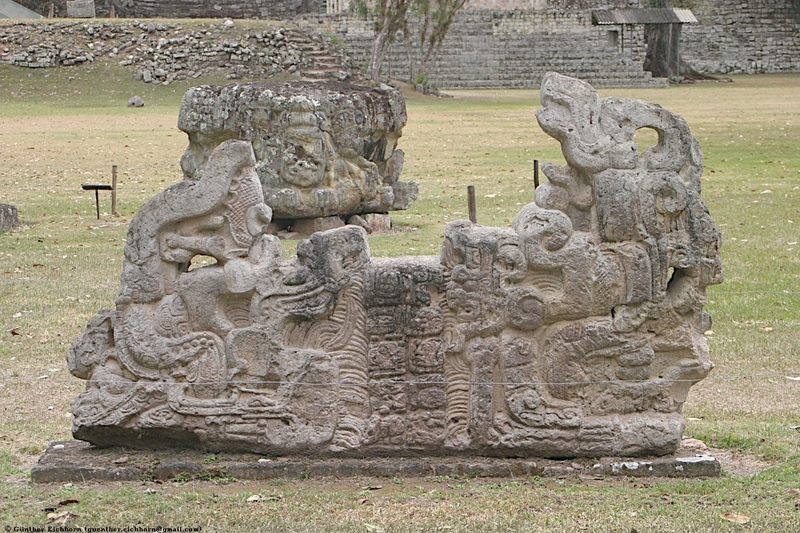 This was the way that the Maya symbolically saw their world, upon the back of a crocodile in the ocean. 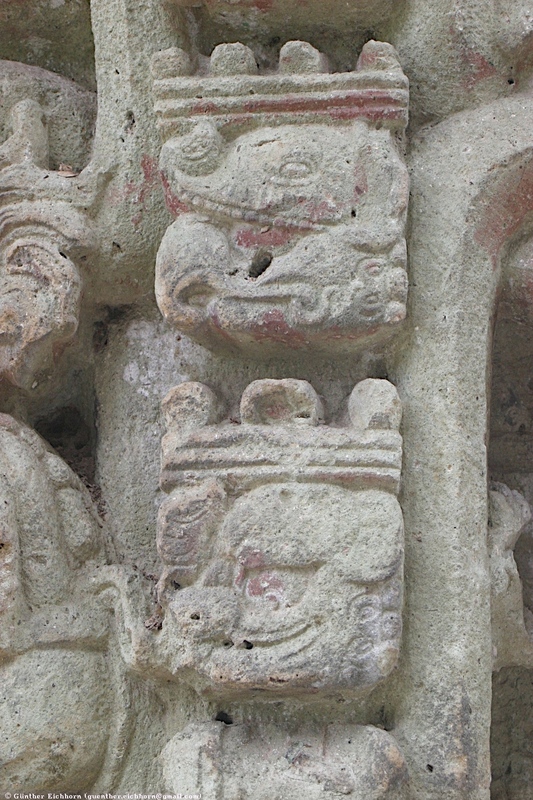 A procession of four supernatural figures flanks the east and west sides of this altar. 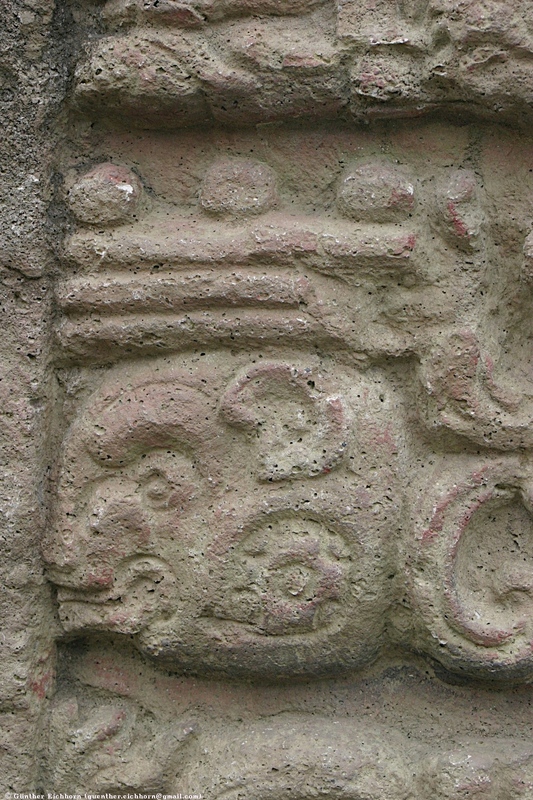 The west side is headed by a macaw symbolizing the setting sun. As the rising sun, a bat leads the eastern procession. 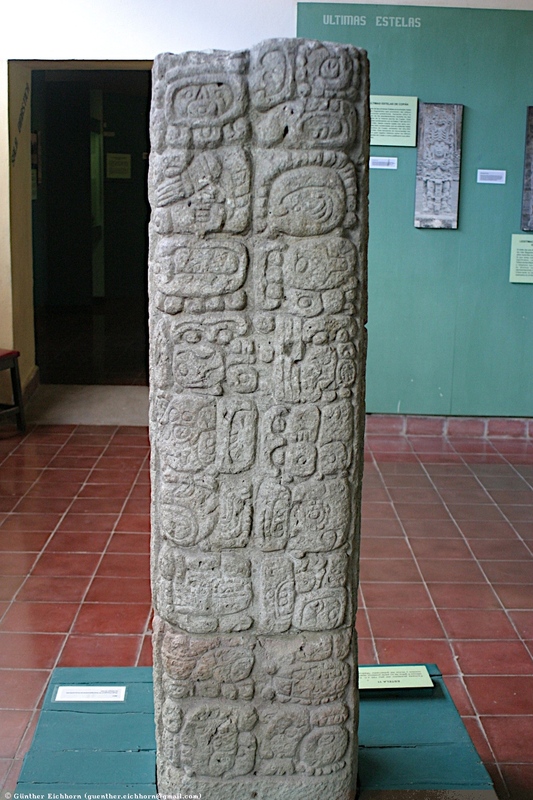 The original of Altar U is in the Museo Regional de Arqueología in Copán Ruínas. 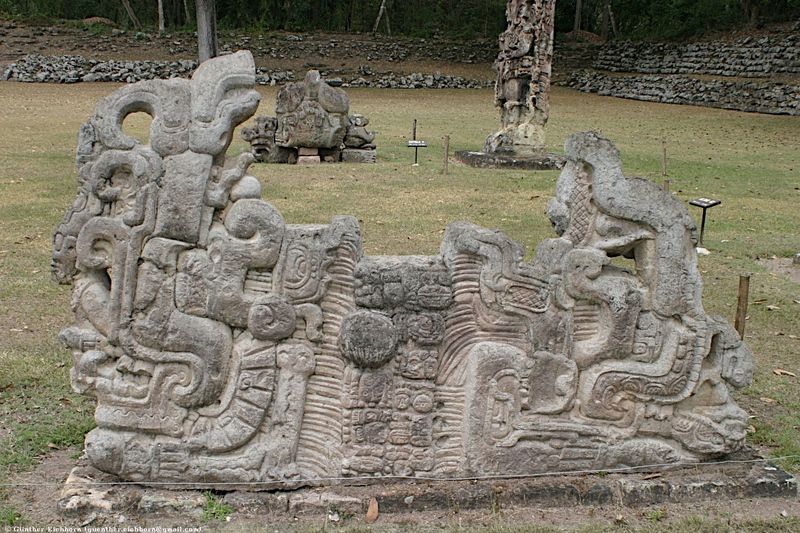 It has extensive hieroglyphic inscriptions. It was dedicated by Yax Pasaj Chan Yoaat (Yax Pac, Rising Sun) in 795 CE, just five years before the last mention of his name in Copán. The front side, pictured here, represents a colossal earth monster. Small glyphs for Ajaw, "lord," form the pupils in the monster's "Sun Eyes." 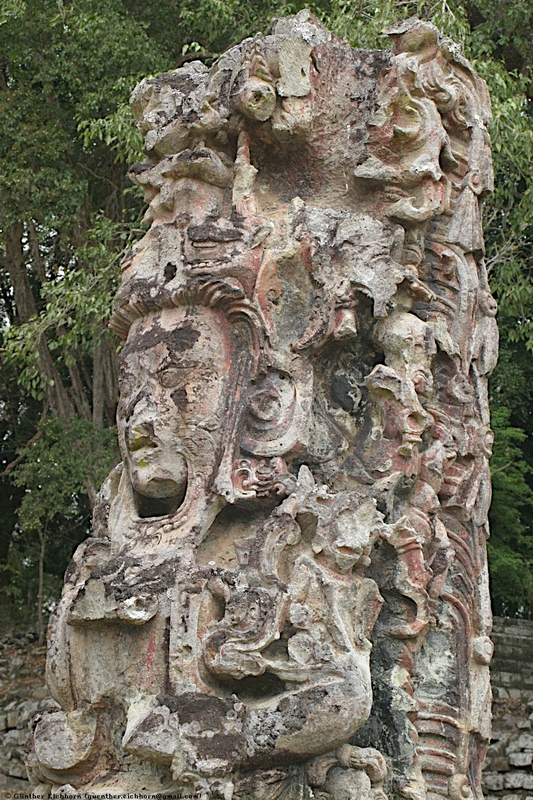 The reverse side of this stone monument is inscribed with a text known as the "Rites of the Rulers," commemorating the rites performed by the new ruler Yahau Chan Ah Bac, the half-brother of Yax Pasaj under the same mother. Yahau Chan Ah Bac assumed office in this year: not with the full power of the king, but under the dynastic succession and authorization of the "Rising Sun." 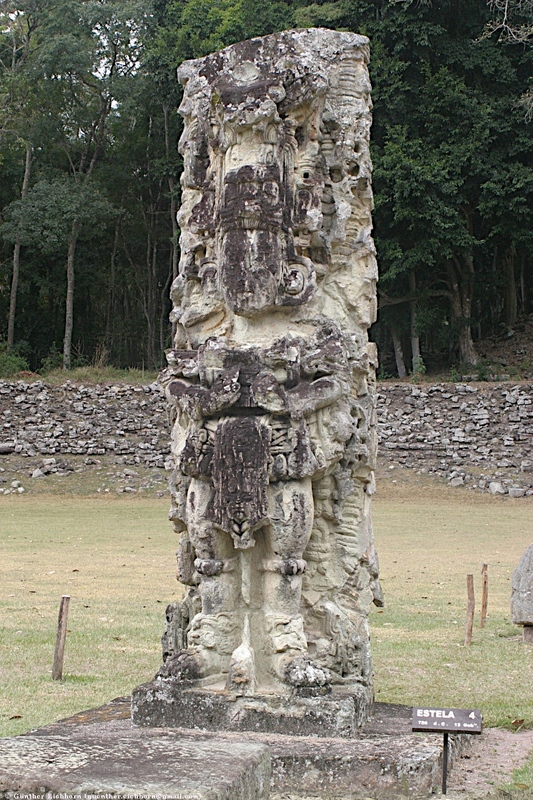 Stela 1 is located on the west side of Temple 9. 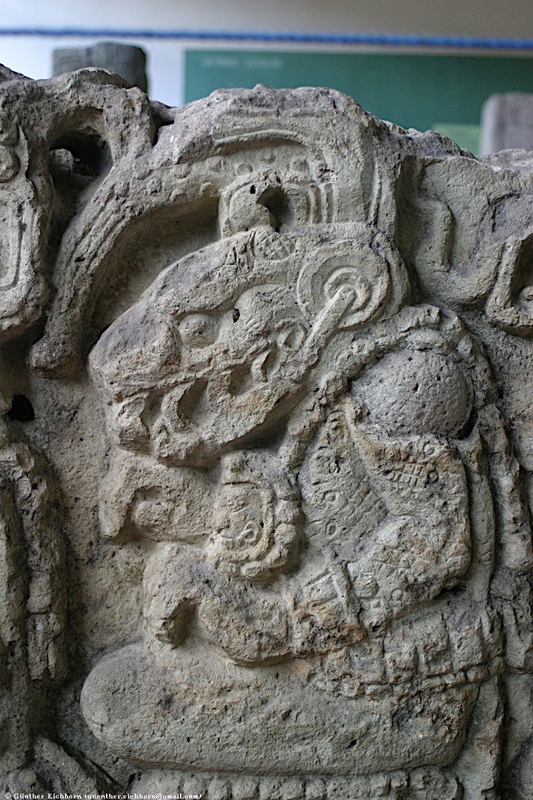 It shows the 12th ruler of Copán, K'ak' Nab K'awiil (Smoke Jaguar), wearing a mask. 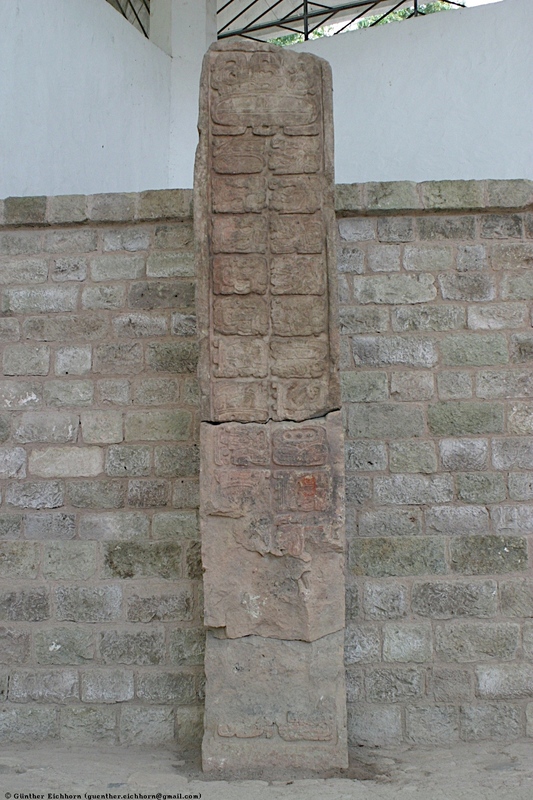 With an Initial Series date of Long Count 9.11.15.14.0 (May 3, 668 CE), was the earliest in-situ monument in the plaza. 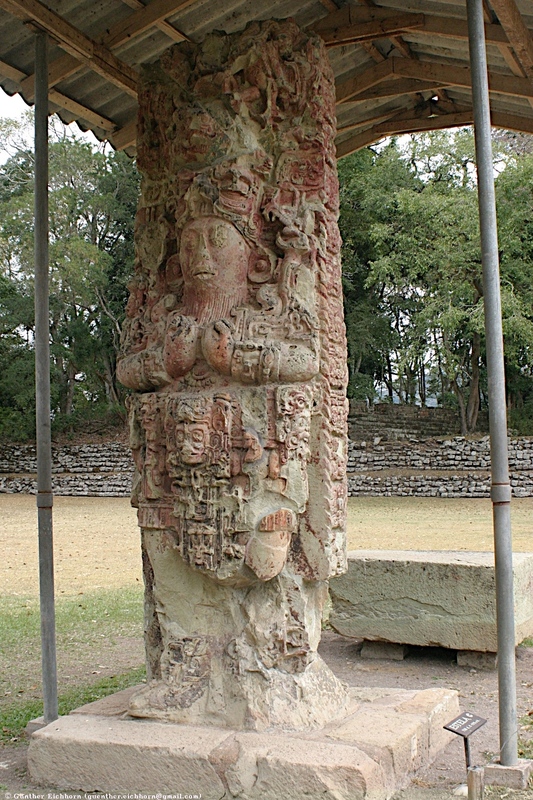 Stela 2 is located at the north end of the ball court, overlooking the playing alley. 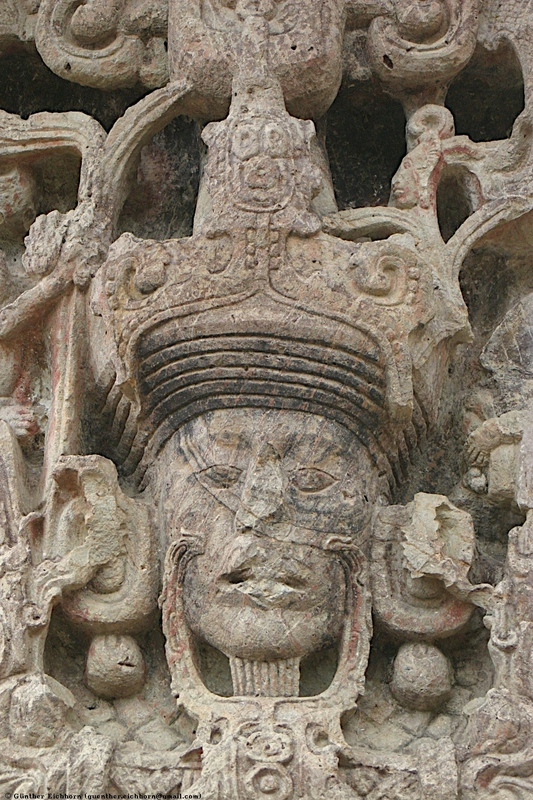 It bears a portrait of the 12th ruler of Copán, K'ak' Nab K'awiil (Smoke Jaguar), in ritual attire to celebrate the completion of an important calendaric cycle or "period ending" in Long Count 9.11.0.0.0. 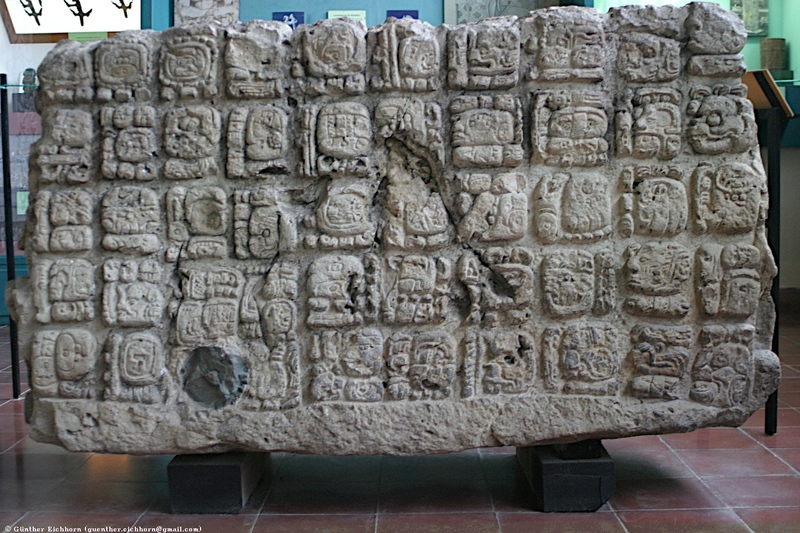 This dedication date corresponds to 652 CE, twenty-nine years after the erection of Stela P.
Stela 3 is located in the Great Plaza, in front of Temple 4. It was built by Chan Imix K'awiil (Ruler 12) on Long Count 9.10.19.5.0, commemorating the 11th k'atun after his accession to the throne. 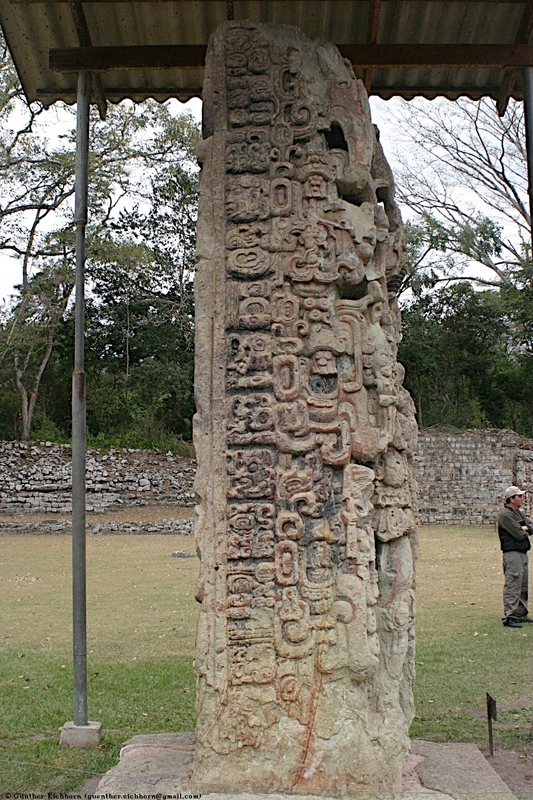 This stela seems to have some astronomical significance of the placement and dedication time of this Stela. 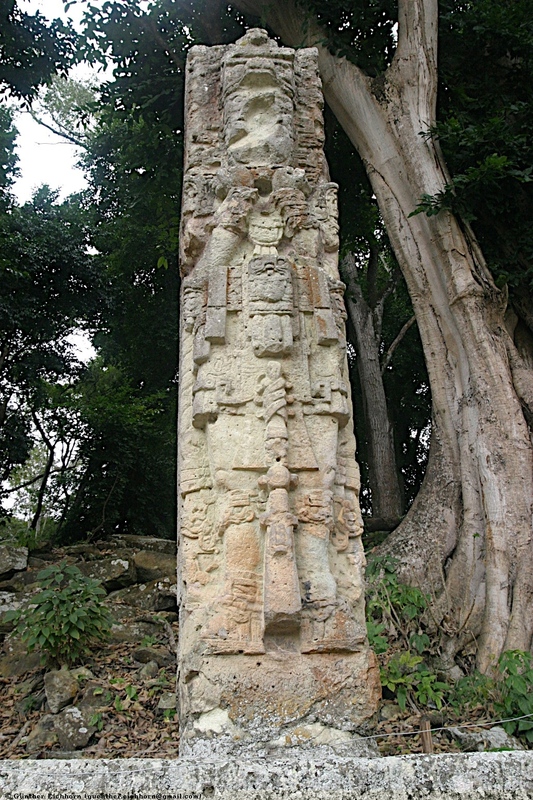 Stela 4 is located in the Plaza de las Estellas, between Stela A and Stela B. It was dedicated at Long Count 9.14.14.0.0, Calendar Round 11 Ajaw 13 Sak' by 18 Rabbit. 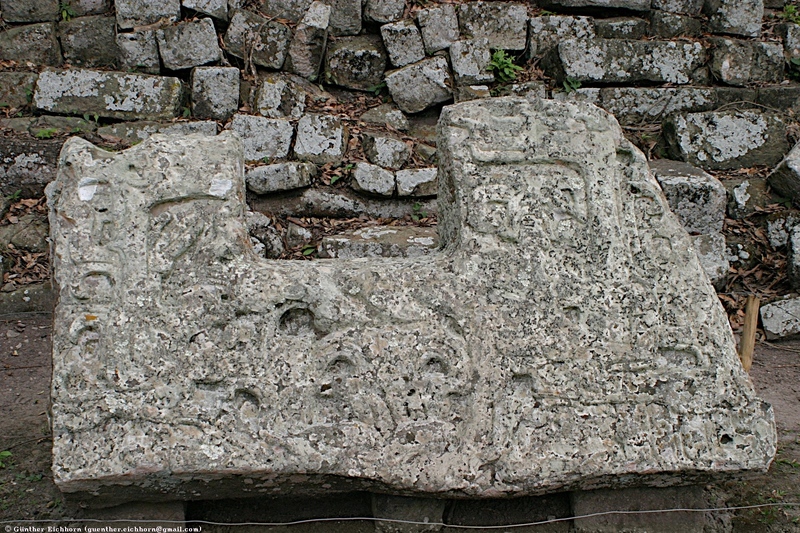 Stela 11 is located in the south-west corner of the Acropolis complex. 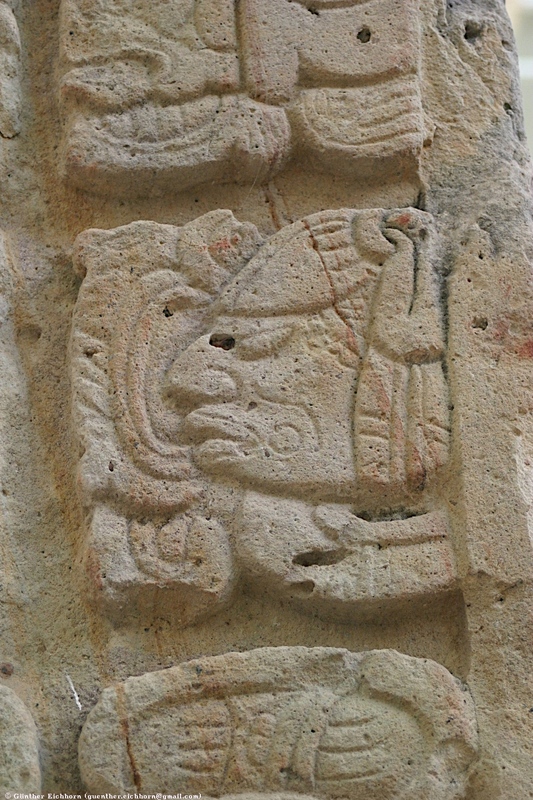 Yax Pasaj in the guise of the bearded Corn God, standing upon the jaws of the Underworld that he is about to enter, appears in this Stela. Its text reads that the death of Yax Pasaj, which probably occurred around 795 CE, officially concluded the dynasty founded by Yax K'uk' Mo' in 426 by "knocking down its foundation." It was written no earlier than 801. 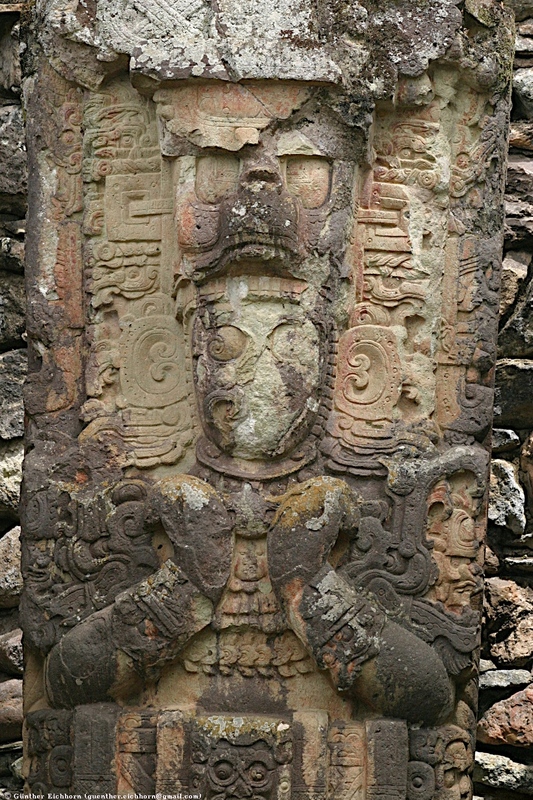 Stela 63 was found buried under structure 10L-26. 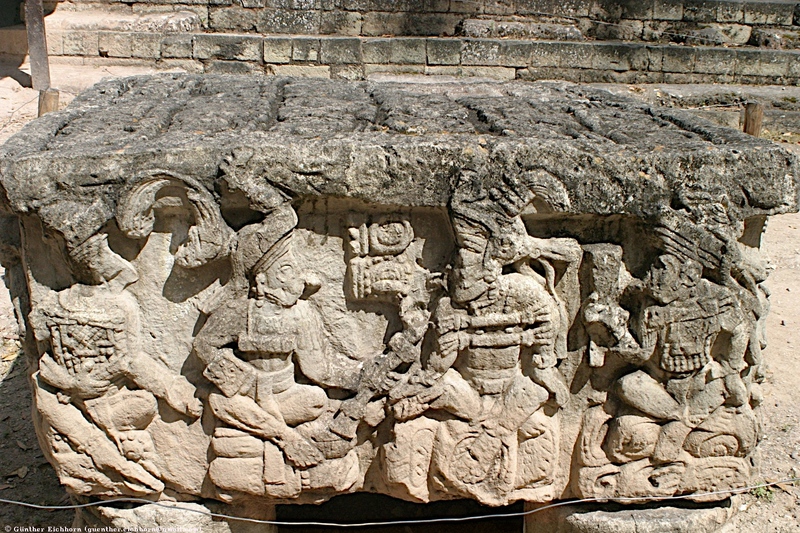 On the Stela is the Maya date of Long Count 9.0.0.0.0, ( 9 b'ak'tuns, 0 k'atuns, 0 tuns, 0 winals, 0 k'ins), which the rulers took to be the base-line of their dynastic history. This date was of great historical significance. 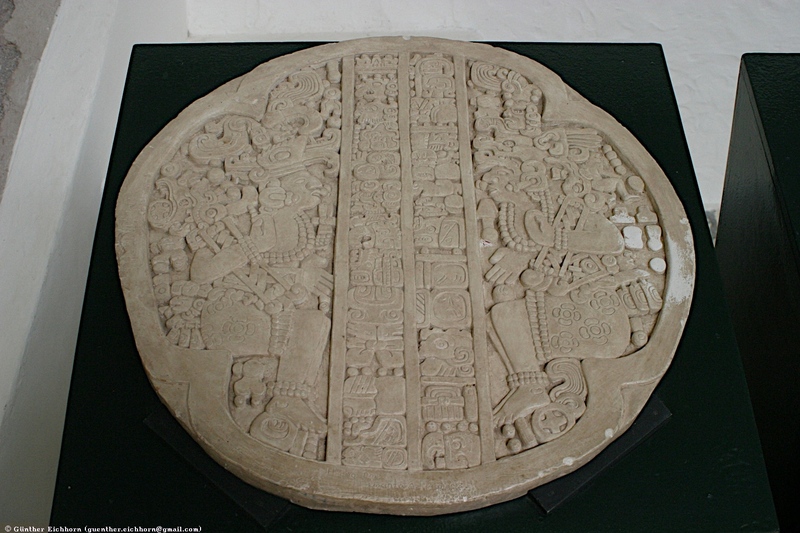 Stela 63 was carved as a retrospective commemoration of the completion of one of the most important calendaric cycles for the Maya, the b'ak'tun, or period of 400 approximate (360-day) years. 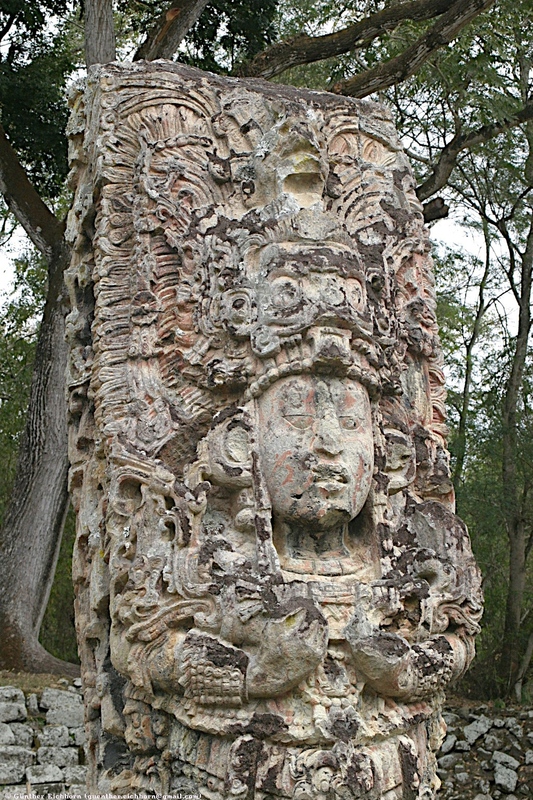 The 2nd ruler of Copán, K'inich Popol Hol, was shown as the owner of this Stela. The Stela marks the completion of the 9th b'ak'tun since the beginning of the present era, calculated to have begun in the year 3114 BCE. This "Period Ending" was a particularly important one, similar to what the year 2000 was for Western civilization; a time-marker, a point at which to pause and reflect on one's achievements as well as one's challenges for the future. One of the most significant historical sources from this early period is also among the most enigmatic. This is the so called "Motmot" marker, named after the early classic structure in which it was found. This flat circular monument displays two richly dressed figures facing one another on either side of a hieroglyphic inscription in two columns. In some respects, this arrangement foreshadows the south side of Altar Q. 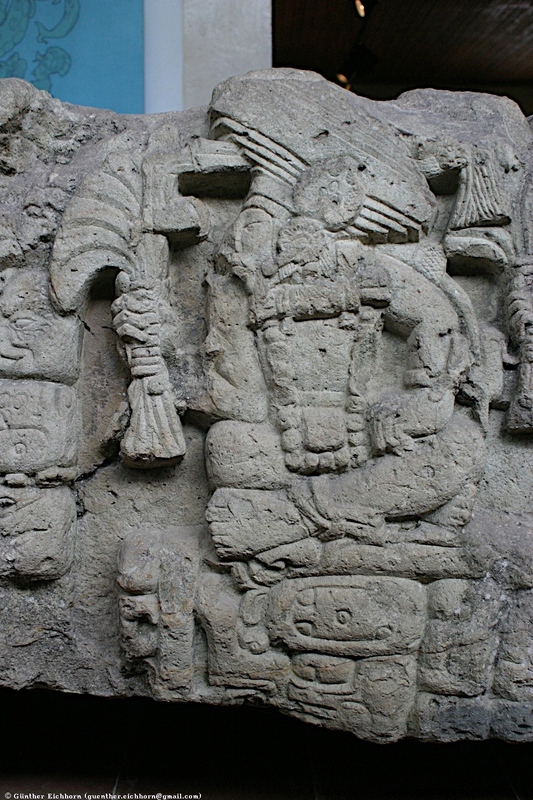 Some details of the carving are eroded, but there remain enough elements to identify the left figure as Yax K'uk'Mo' and the right as his son, Ruler 2. It seems likely that this monument dates to Ruler 2's reign, in fact, and it may be among the earliest dynastic monuments from the main acropolis. 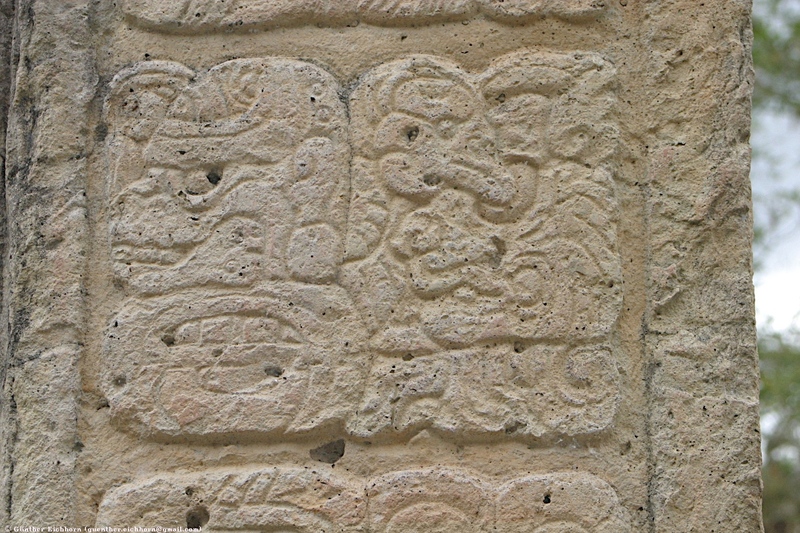 The inscription is extremely difficult to decipher, but recognizable are the name glyphs of the two rulers, a date, as well as mention of certain ritual activities. 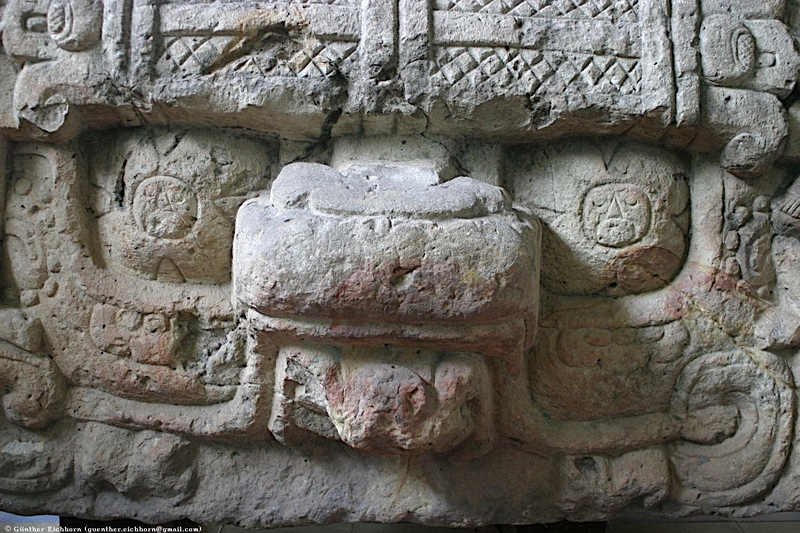 The bound haunches of a deer represented by one of the glyphs in the lower left column is especially intriguing, since below the marker stone were found the bones of a sacrificed deer, along with human remains. 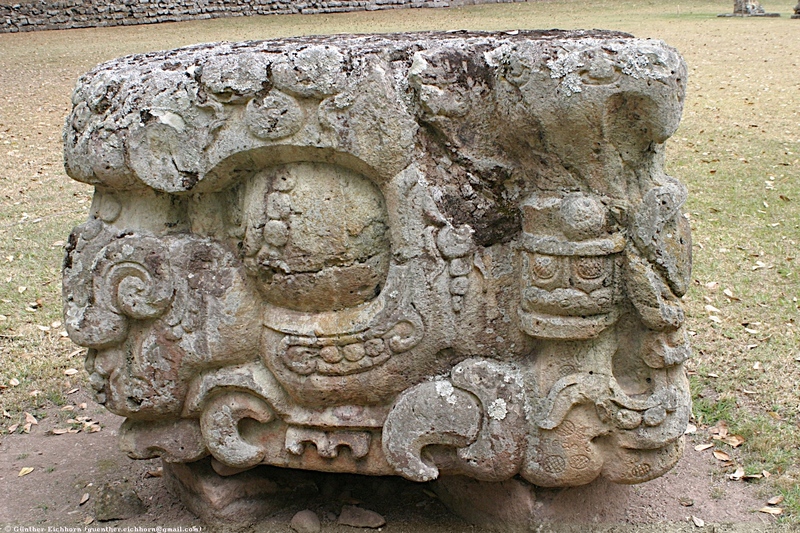 Part of the text, then, may refer to certain specific rituals that occurred at the dedication of the stone itself. 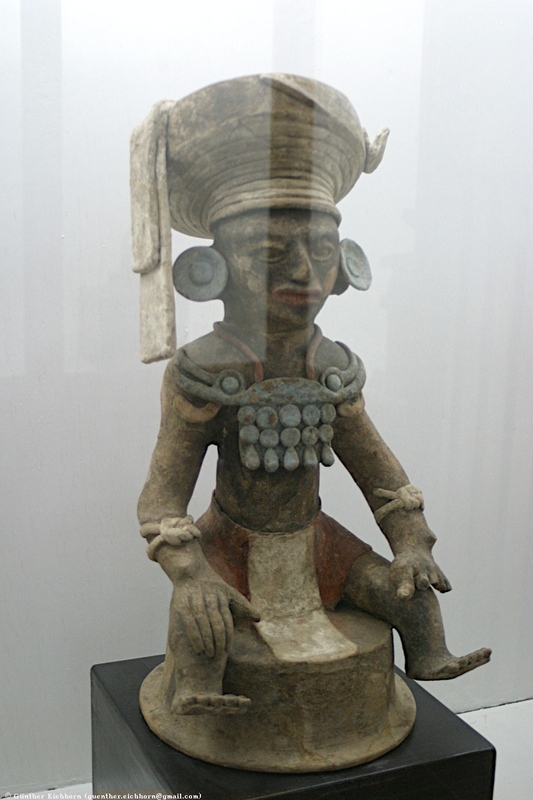 These are a few pictures of statues from the museums.